Posted in Fishing, Outdoor Activities, What to Do? San Carlos Fishing Report with yearly guide, weekly fishing reports and fishing tournament information. 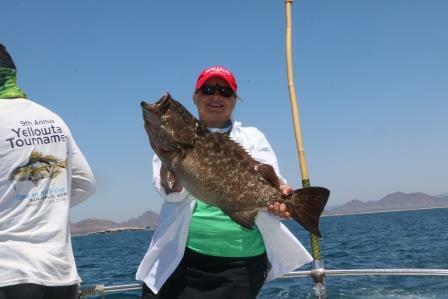 San Carlos Mexico has great fishing in the Sea of Cortez. 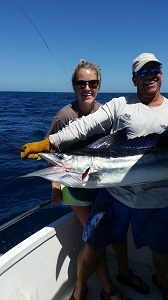 Sports fishing has been popular here for decades with the waters full of big game fish like marlin (3 types: blue, black and striped), sailfish, tuna, and dorado. 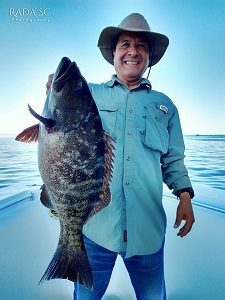 You can find grouper, cabrilla and sierra all year. Marlin & Sail fish: June through October. 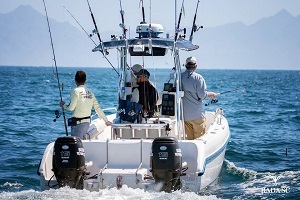 Click for information on 2019 San Carlos Fishing Tournaments and information on San Carlos’ two Marinas. The tournament pages also have results from past tournaments. Wondering where to buy your Fishing Licence? Before you head out, check the weather and tide chart. Check out the bottom graphs on Tablasdemareas.com for Guaymas to see when they predict the bite times. 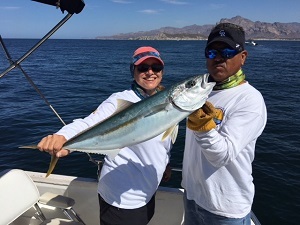 San Carlos Fishing Reports: by Bryan Replogle, Team Margarita Sportfishing, repsilon@aol.com. You can also find the fishing report in the newsletter every week. The water is cool, but things are heating up. The weather is improving with less wind and warm air. The lunar phase is looking better this week, along with the tides and currents. So now just to get the fish to bite! 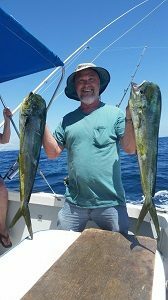 Yellowtail were biting good at times last week. There were some big ones at the Island, Pando, and off San Antonio. A lot of sardines and crab are still out there in areas, bringing in masses of sardine boats. The fish might not be having to work too hard for their meals and they are hanging around these areas of enormous bait schools that are mostly in deeper water. Keep an eye out for the birds, and don’t be afraid to look 4-5 miles offshore for the activity. Just keep at it enjoying the nice weather and good fishing will happen soon. Are we at a turning point of the season? In the middle of summer we often hit a slump when the water is too hot and most of the fish have moved off. I often believe the same thing happens during the winter. The water is coolest around our area at the moment. I believe that the bonita are gone for the season. It use to be that most of the yellowtail left too along our coast mid-season, but they could turn back on as we have often seen in recent years. The storm turned up a lot of seaweed and dirty water, and the water is below the temperature preference for yellowtail. 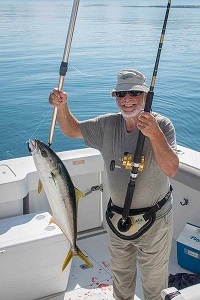 There are still lots of yellowtail at the Island and up the coast, but it’s another matter to get them to bite. Reports were pretty dismal all around the last few days, but that is pretty typical of this moon cycle. There were a few decent catches from all over last week. The bite should be better this weekend. The forecasts for wind and temperature should get better. Good Spring tides and fishing should start up in the next few weeks. The bass are in an extended spawn at the lake currently. There is still some good bait at all depths right now, so maybe they aren’t too hungry at the moment. It’s about time they start fattening up for the spawn in a few months. The cold water and seaweed should fuel a massive Spring hatch of bait. A couple weeks of patience should be rewarded soon! 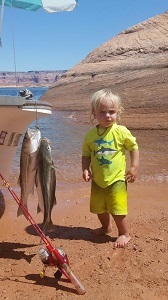 There were some fish caught last week. On Wednesday morning we had a quick hour at the Seamounts catching five big yellowtail. The next morning we only caught one later on. I told a few friends just to try in close, rather than the Island. My friend’s boat was down, so we didn’t fish the tournament, but we caught enough to win it. After several glass-calm days, the wind came up for the 13th Annual Yellowtail Fishing Tournament. Many braved the high seas and went over to the Island. 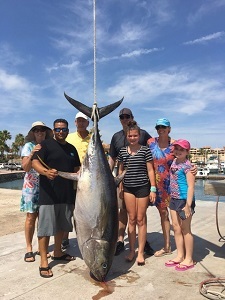 Most boats caught 2 to 4 yellowtail, although Team Catch-a-lotta weighed 9 yellowtail weighing 150 pounds, and the big fish of the day at 21.5 pounds. Their luck wore off for Sunday, losing the one fish that they needed to win. Team Fins Up weighed six good fish, and the big fish of 22 pounds for a second consecutive win. A few teams caught a number of smaller fish up the coast, and jigging off Lalo’s. The bite in close has progressed a little later in the day with the full moon. We caught 7 bonita, a few small yellowtail, and one about 12 pounds Saturday morning off San Antonio. Then around 10:30am we found the school off an eastern Seamount, and continued to get 9 of 11 15-20 pound yellowtail. We were holding on towards the end, but they walked away with more fish than they probably know what to do with. The water was dirty, but they found our colorful lures trolled slow and deep. The next group brought bananas and had lost patience before the bite time. On Monday we caught a couple midday, before they went deep. The fish are around! There is still lots of bait everywhere, even after 19 boats seined the area Friday. There were reports of acres of fish boiling at the Island, but they were focused on the real thing. Sometimes you need to find the hungry ones! Things should be heating up for this weekend’s Yellowtail Tournament, except for the weather. It will be fishable, but not comfortable. That won’t matter if the fish are biting. It seems like the infestation of crab may be diminishing. We should be in a good lunar phase with strong currents this week, so they should be feeding. There are still some good numbers of bonita offshore. A few yellowtail are inside them, but not too close to shore. We caught one decent yellowtail on the outer Seamount on Tuesday. Over the weekend they were outside Lalo’s, within a mile of shore. We caught a few from 17 – 23 pounds. There was a big school, and they were biting good Saturday afternoon. I heard of one great catch from the Island, and another up at Pando. The fish are around and they are large, but they are stuffed with crab and feeding selectively. The wind has kept a lot of boats off the water. It might be a better week to hit the spawn at the bass lake, but there will be some weather opportunities for some good yellowtail fishing this week. You can put away the rods and pick up the paddles this weekend. Well, if you play pickleball. The bite was good for a couple days before the new moon. On Tuesday it seemed pretty slow and our hot spot had mostly dried up. A friend scraped up a couple at the Island. They bit pretty good there and at Pando up the coast on Monday. 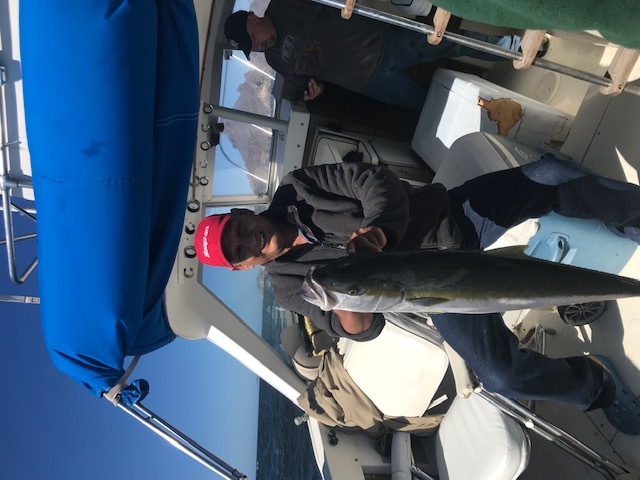 The weekend had a good midday bite going on bonita offshore and smaller 4 – 8 pound yellowtail at Piedras Pintas. The water was flat calm all week. We found the Island loaded up with crab, but saw even more in close on Sunday. You could have picked them off the water with your hands. I have never seen it like that. The fish at the Island and Pando are 20 pounds+, so hopefully they will turn on for the tournament next weekend. The fish everywhere are stuffed full of the crab, but some still wanted to kill something. It is looking windy for a couple of days, but expect a great bite on the quarter moon after the weekend. The bonita don’t want to leave this year! Water temps have dropped, but the bonita are still out there in great numbers. The fish are a mile or two offshore, so they could take off at any time. There were some smaller yellowtail in close on Tuesday. Most of them were 4 – 6 pounds, but we did catch one of 11 pounds. A few larger fish have been caught at the Island and up the coast, but no great catches. A good amount of bait is still around. We saw a couple Humpbacks over the weekend right off San Antonio. Some decent bottomfishing reports are coming in. It should be a decent week on the moon phase, so we will see if the larger yellowtail start biting. We made it through the blood moon, and things were bloody. The hot bite at the Seamounts last Tuesday dried up quickly. Even the bonita seem to have left there, although we have scrounged up a decent cabrilla and one small Baya Grouper in the Bay. The offshore Cuatro Chichis bite was strong today with lots of bonita. A few small yellowtail are in the mix out there. The jigging is decent out there, with a few larger models biting at times. They hit the same mix up the coast, but we found big ones there on Monday. The bait was extremely small though and the fish didn’t want anything but their soup. We did catch our biggest yellowtail of the season and a lot of bonita and calicos. I have yet to hear an Island report. A few Fin Whales and one small Humpback have been around. I have seen a few mantas, and today the Orcas passed right by Doble. We followed them up to San Antonio where they took a few jumps and we parted. You never know what the day will hold on the water. The bite is on! Maybe I will see you at the hot spot tomorrow. We tried to run from the bonita, but they were everywhere on Tuesday. We struggled to make double digits on bonita for a couple days, but not on Tuesday. Get out there before the ‘pre- full moon slump’, however long that ever lasts. A lot of langostina pelagic crab have moved in. They were stuffing up fish at the Island, and maybe local fish might experience some ‘crab constipation’. They were also stuffed with small baitfish lately. I keep seeing big fish marks in close around huge bait balls, but they weren’t biting. The seaweed bite unfortunately and prematurely is excellent in close. We caught some bonita and large barracuda around the inshore bait balls on Tuesday. It’s possible that some of the marks are yellowtail. We caught some small yellowtail around birds dipping for langostina on Sunday. Any upwellings help push up the crab, so watch for those birds working. As I turned over the second round of bonita cleaning to Arturo this morning and tried to extend our trip and sight seeing and photography along our beautiful coastline in glass calm conditions, we came across four pangas hauling them in on the end of the Seamounts. In a little over an hour we had our fill of medium to large sized yellowtail caught on the jig. It was great to see the yellowtail finally turn on again, and especially right in close. Some afternoons have produced. Water temps were up to 73 today! Some warm currents are still pushing up from the south. The water is clear. I don’t think we will see a marlin, but plenty of fish should be caught if you are on the water this week! There are still plenty of 4 – 7 pound bonita out there. There were some good schools in close, but 1 – 2 miles out seems better at the moment. The Island is covered with langostina crab. I haven’t heard of any reports from up the coast. It has been a little too rough for bottomfishing. 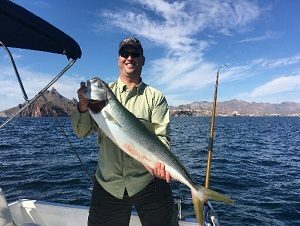 Some yellowtail are in the mix off San Antonio, with mostly smaller fish. There are some into the mid-teens though. Jigging has produced a slow steady bite, sometimes giving the large seals enough time to digest each fish brought up to them. The bite has been good on the right moon phases, and should pick up in a few days. There is a lot of bait in areas. I haven’t seen any surface activity, but we’ve been sleeping in and haven’t been out in the wind. The water should start cooling soon and push the bonita away. Maybe they have been keeping the yellowtail away. The quarter moon is coming up, so expect a hot bite in a week. We had an excellent week of yellowtail fishing. Deer Island was the hot spot, and we had it all to ourselves the first day. We restrained from filling the box. 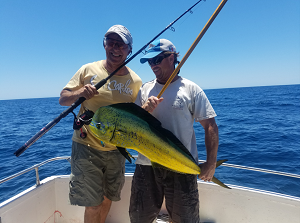 It was one of the best trolling bites that I can remember for yellowtail to 18 pounds. 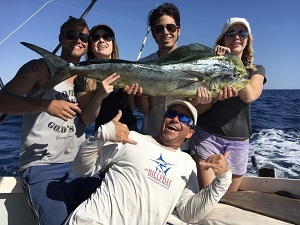 It seemed like they pushed the bonita out of the area and we were catching mainly yellowtail. The bonita were still thick in areas, but not quite as big as they were. The fish were stuffed full days before the full moon, but they were still feeding right up to it. It might be late in the week before they start feeding again. There is still a ton of bait in areas. A lot of small yellowtail are around, but it was good to see some big ones start to feed, especially in so close. Some friends saw them boiling along the beach. A few Sierra were in the mix. There are reports of corvina in close. We had a lot of nice mornings. Water temps have been 67 – 68 F. The Island fish are full of crab, but it sounded good up the coast. Some fish were biting the jigs, with one of 22 pounds caught at the Seamounts. We had a couple big ones use the bottom to gain their freedom. 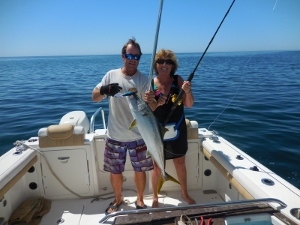 The yellowtail fishing has been picking up. The hot spots are still bouncing around daily, and even throughout the day. Just like last year, chasing a couple day-old hot reports doesn’t work. The bonita fishing is still excellent, although it sounded like they were moving a little more offshore. 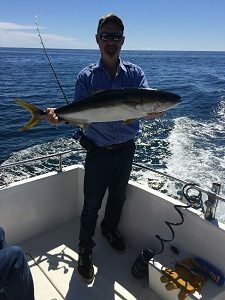 Some friends caught a number of decent yellowtail on Monday, but I am not sure which story to believe of how and where they were caught. There were some good yellowtail deep off San Antonio (Cuatro Chichis). There have also been a few big ones in tight around San Antonio. There is still an incredible amount of bait in areas. The fish still aren’t coming to the surface, but that could change soon. I haven’t heard of a hot White Rock bite or at the Island. There have been some hungry seals up the coast, as well as in town. A friend did pick up a 30 pound trophy at the Island. Tortuga sounded slow, with San Marcos having surface activity. The Seamounts were hot for a few days, and Haystack has had its share of reports. 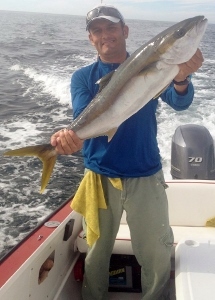 All areas have had different sized yellowtail at times. Purple still seems to be a hot color. A small green and yellow was a hot jig. The water is staying relatively warm and clear. Terrafin showed a warm 72 degree current pushing right to the coast, but no reports of pelagics. Fishing should be good through the full moon, where it will switch to a midday bite. Same old story, but at least it is about catching too many fish. There are a number of small yellowtail in close, but predominantly it has been a mix of small to large bonita. 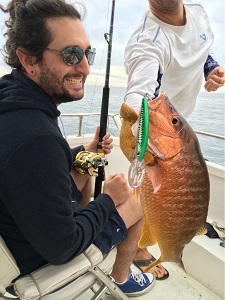 I finally caught one snapper, but I can’t seem to find a cabrilla left in close. I haven’t caught a big yellowtail in close lately, but a few have been caught on the Seamounts. A few big ones came to my popper at Haystack on Saturday, but not the last few days, although smaller bonita and yellowtail there kept us happy. Warm 72-74 degree water is just off the coast, but my hopes of tuna, dorado, and marlin may end on Wednesday. The Island and up the coast have had some better yellowtail at times. The beach catch has been decent if you can find the bait schools. The ‘eastern’ Seamounts were red hot for Bonita. We hit five triples one day in about a half hour of fishing. A few huge anchovy schools came through after the full moon. Keep at it and you will be sure to fill the cooler most any day this week. We are still experiencing a legendary bonita bite. The yellowtail have been pretty sparse, but there are a few small ones around. Some of the bonita have been pushing 10 pounds. Lalo’s Rock and the Seamounts seem to be the hot area at the moment. They were hitting some larger lures today, but small purple Rapalas are killer. I haven’t heard any reports from the Island or up the coast where the larger yellowtail probably are. 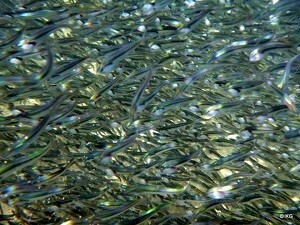 Some huge schools of sardines have moved through. A lot of ballyhoo are still out there, and they were full of big mackerel earlier in the week. Some Sierra and Skipjack are still around. A few Roosterfish and Corvina are patrolling the beach around Pilar in the morning. A few yellowtail have been caught in close. I did see a couple turtles today in the 70 degree water. It is 75 F 30 miles to the south and I am not giving up hope that there will be a tidal and lunar pull of the warm water and pelagics into range in the next few days. Most people are happy with a few hours in the morning catching easy limits of bonita, but I am getting tired of cleaning, packaging, and smoking ridiculous amounts of fish. Things could be worse. The fishing has been too good! We were spending more time cleaning and packaging fish, than our actual fishing time. Sometimes we were driving away from the fish, … well, mainly to look for bigger ones. We did find a few larger 10 – 18 pound yellowtail around Deer Island. A lot of the bonita were 6 – 9 pounds, but as the water cools they seem to be getting smaller. We had an invasion of small yellowtail, and they came back on Tuesday. A lot of the fish have big mackerel in their bellies. There is a lot of bait out there. Purple seems to be hot at the moment. The inshore action is cooling off, but we had a fun week catching fish from shore. A few more mackerel, corvina, and snapper in the mix now. One boat headed offshore with little success. It still shows 75 past the Reef, and 77 to the south. The forecast shows light winds, and I wouldn’t be surprised if the 77 degree water off the Yaqui River Valley doesn’t get pulled up our way after the full moon. A friend took some kayak fishermen to the Island for some success. I heard of a good report of large fish from up the coast. There was a rumor of big ones from Haystack down off Guaymas. One friend slayed them on a windy day off the Seamounts before they seemingly left. The eastern side of Deer Island was hot on Tuesday. The fish are out there, so go get them! Freezers should be filling up this week. If you are having trouble, then come on down to the Farmer’s Market at Shots in the marina Saturday and I will be selling fresh and fresh-frozen fish. There are lots of fat bonita out there and some good yellowtail. The yellowtail are starting to come to the surface after the cool winds. On Tuesday morning we found a lot too small to keep, but there were a few larger ones. We caught 9 – 12 pound yellowtail off Deer Island on Sunday, but they will be moving around. There were some big ones around the Seamounts on Tuesday. As the water cools, they may start to chase the bait into deeper water. All of the major points and rocky areas could be harboring the schools. There is an excellent supply of bait out there. The fishing along the shoreline has been exceptional at times. I haven’t won the battle on the last few big ones, but the light tackle has been good fun. I think I caught a different species on my first five casts the other night, and caught a fish on every cast for a half hour. The pelicans are getting fat. At times you could scoop handfuls of bait out of the water. Winds are preventing anyone from heading offshore until Friday. A couple boats were out that I have not heard from. We picked up a couple 8 pound dorado in a few hours, and I did hear of a 32 pound dorado caught at the Island. The water is still up to 77 degrees out there. There could be big schools balling up the bait somewhere. One report was that the marlin were 30 miles to the south. The weather looks good after this big blow. It’s not quite winter yet! Summer is hanging in there. One final storm far to the south threatened to reach hurricane status. The wind blew in the afternoons, but mornings were nice. There has been a steady catch of bonita, with a few larger ones. I never heard an offshore report, although the water is clear and warm 17 miles to the south. It was clear and up to 78 in close, probably keeping the winter fish deep. A number of small yellowtail are along the shorelines now. A few bigger ones were picked up up the coast. The Island has been a little slow, but we caught a nice mixed bag of fish Saturday. The fishing will pick up when the water cools. Shoreline fishing should be good this week. Look for the pelicans and they will be near the bait schools. I finally saw the school of jack crevalles, locally called toros. They were right off my shoreline and the first one made me going swimming after him. Then the school attacked, throwing hundreds of mullet jumping in every direction. I hooked one, but the battle was short. I ran back and got a paddleboard and proceeded to catch three big ones on poppers. They were towing me pretty good. The next day I was able to fool one more, before they got smart and eventually left before another was fooled again. I caught a number of corvina and snapper too on topwater, which is always an exciting strike. We will be headed south on Wednesday looking for a final taste of the summer fishing. We have a mix of seasons at the moment. It has been quite the contrast lately. A common pattern is for the warm water to get sucked up the coast after the full moon the last few months of the year. On Saturday, the current was pulling nearly three knots at times. The pick was a little slow for a few bonita for a few days, but we found the yellowtail on the end of the Seamounts. I was just telling the group that that was the spot where we caught the first grande last year. They were all 15 – 20 pound fish. That was the hot spot last year until mid-February. By Sunday, the water had nearly warmed up by 5 degrees and we couldn’t get a bite. The inshore bait arrived, somehow evading the million skipjack out there. There are crazy bait populations in areas, thousands of ballyhoo in close and sardines that turn the water black for thirty yards. I caught small Sierra every cast from shore, and the pelicans are feasting daily. Find the bait, and you will find the fish. The water warmed up to 82 degrees! 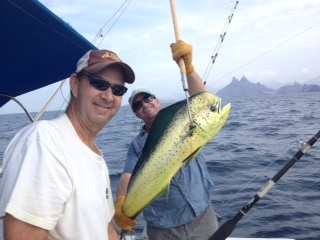 We have been getting a few dorado weighing up to 18 pounds. A friend saw a couple of marlin, but they are strangely absent. The water cleared up in a day, but I am not sure where the better pelagic concentrations are. We caught the dorado within 8 miles, but some were caught within a mile. Fishing at the Island for a good grade of yellowtail was consistent. Sometimes you need to put in some time to find the hot spot, or for the bite to turn on. Some excellent bottomfishing catches were had. There are a number of dolphins around and I’ve seen whales migrating through. We are getting a lot of very nice days on the water, so don’t wait for winter to settle in. It is looking more like winter every week. Water temperatures are dropping drastically, with many harmless red tides forming. We caught one 15 pound dorado right in the middle of one. Another of 20 – 30 pounds got off right before the boat. We caught the bigger ones halfway to the Island. A lot of small ones are out there in areas. A few marlin were on our line, but unfortunately not for long. I’m not sure where the numbers are hiding out. Fishing is always a mystery. 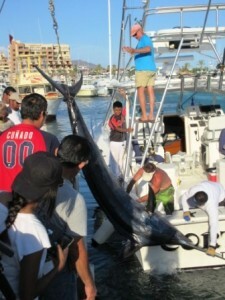 We could have filled the boat with bonita last Wednesday, and some were pushing 10 pounds. The rest of the week we had steady catches of a handful. Some big Sierra are around, along with a lot of smaller ones. Things should continue to improve. Boats jigging the Island have had steady catches of decent sized yellowtail when they put in the time or hit the bite. They have been absent in close, but the water is still warm for them. Bait numbers are steadily increasing in close and the shoreline fishing should start up soon. The mantas came through last week, with a few still around. The dolphin are in areas and we saw one whale. An occasional turtle will pop its head up, and there are lots of seals around. The Bisbee starts Wednesday, and the ‘little Bisbee was last week. The local boat Predator was there with their first visit to the weigh station in 13 years. Jarrod Smith got the fish in in 47 minutes, with the first place Blue weighing 522 pounds. I am sure that owner Morgan North breathed a sigh of relief. A small dent in their overall expenses, but a long overdue victory! Winter is coming in fast! Northwest winds are predicted for the week and into the next. I keep seeing pictures of snow to the north. I am also watching predicted storms to the south. A big one is forecasted, but it will have to beat into a lot of wind to make it here. The water has cooled off to the mid-70’s on the other side, while here it is still 82 – 84 on the surface. You know that you are warm blooded when it already feels chilly to us. The storm churned up some water and there should be some dorado attracting debris around. I noticed a lot of various baits around today along the shoreline and saw numerous boils. It could get very good soon casting small spoons. I heard a lot of small Sierra were around Piedras Pintas. We caught one yellowtail in the bay in only 40′ of water. They could start boiling very soon. I saw a massive school of bait in 200′ of water, although the jigging bite was a little off this last week. Get ready for it to turn on though. I really only heard of one offshore report from after the storm. They caught four decent dorado and missed a few marlin. There were some very good marlin reports last week. One boat had an excellent catch of a 40# yellowfin, with a few reports the next day. 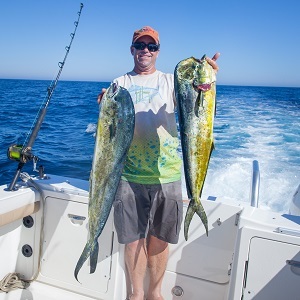 The few dorado being caught are into the teens. I’d expect to see some billfish tailing this week. This is the time of year when you could find dozens of them migrating out together. I saw one just a mile out, so they could be found in close too. The blue water is quickly fleeing, but hopefully some bait will keep them around. The pelagic days are numbered, so get out there while you can! Some reports are coming in. We got back and were out on Tuesday for nice seas and cool weather. The skipjack are everywhere, but left most of our baits alone, although my friends in the tournament said they ate up three bags of their bait in just one day. They were out Friday off Deer Island and caught 8 – 12 pound yellowtail on every drop. The bite has been good out there and around the Island in not that deep of water. It felt good to tie into the first yellowtail of the year. A lot of big bonita are around too. There are some Sierra off the points around San Carlos. You might have to weed through some skipjack. There are a few small dorado and billfish scattered around. A few small tuna were caught around the Horseshoe today. One boat released nine marlin there today, so maybe you just have to find the fish! Baby Girl found them near there for the tournament win, while many boats did not have a good weekend. We’ll see what Sergio kicks into the water on Friday. Good times are coming! Fall is here, or at least the first half, which I will term ‘the pelagic Fall’. I am still in North Carolina this week, so this is mostly a virtual report with hopefully no fake news. 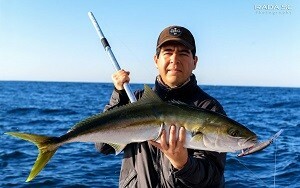 The only photos I saw all week were of small to medium sized yellowtail on the jig. Those 1 – 2 pounders that were all over last Spring have grown up. The water will have to cool a lot more before we see them on the surface or balling sardines. Since it’s October now, it could be soon! Water temps are about 84 – 87. Cool enough for the fish to be active, but we probably won’t see them on the surface yet. There is some NW wind in the forecast which could cool off the surface. This is the time of year where the water can be warmer than the air! The cool water is causing greener chlorophyll-filled water in areas, but that is probably where the flying fish are. Hopefully some other bait will show to get the fish going. This weekend is the Hammer Down Tournament, which is the finale for the summer tournaments. We should see about another month of hopefully good summer pelagic fishing though. They have caught tuna to the south all summer, so hopefully some will finally move our way. We could see some big dorado return, and this is the time for a big marlin. 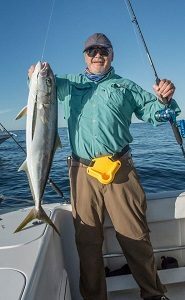 The inshore action should also get going, and it sounds like the bonita and yellowtail are down deep waiting for something to eat. We skirted some weather this week. I am no expert, but it looked like winds from the upper Arctic came down the Labrador Straights, combining into winds off a hurricane in the middle of the Atlantic to push across the Caribbean and Gulf of Mexico to create a sub-tropical Ridge on the Sierra Madres, pushing Hurricanes Rosa and Sergio to the west. At first the forecasts looked pretty threatening. The typical tracks this time of year and with our warm water … we dodged a bullet! A few models have Sergio still threatening in twelve days, but I wouldn’t worry. It looked like an Arctic cold front that came down the East Coast and some Pacific Northwest fronts also helped to push Rosa out. 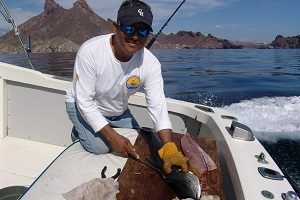 All that messy rain in the northern Sea of Cortez will help spawn some good bait. I think we’ve had sea conditions here that should have some good nutrients around for baitfish. The shorelines should have some great snorkeling. Lots of people are ready to fish this month, and I don’t think they will be disappointed! Here in N.C. we struck out on the inshore Redfish and large-mouth bass. I think I have made coffee clearer than the water here. Hurricane Florence left quite a mess! I might get offshore, but may have missed the lunar bite. One friend was out the last five days catching tuna and 54 wahoo from 40-60 pounds. It doesn’t get much better than that! Change is coming. On Saturday before we left, I finally saw some skipjack boiling from the shore. I haven’t seen much small bait from shore, besides a lot of ballyhoo, but all the signs are there. The water is clear, there’s some green seaweed on the rocks, the waves are down, and the water is refreshing. The air is drying out and the winds are down. All ready for a big blow, one direction or another. The clear skies and light southern winds should keep the water warm. The same pattern for the last month seems to be in place pulling in cooler water from the west. It seems to make it to the Reef, where the water then is warmer and clearer. A few Marlin and dorado seem to be scattered all over. Some friends found one buoy out there with dorado weighing up to 12 pounds. 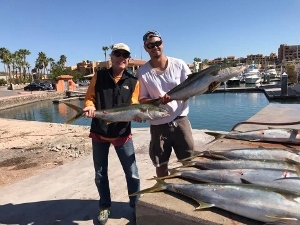 Another friend seems to continue to jig up some meals of yellowtail around to 12 pounds. The moon should make for some mid-day bites and strong currents. Besides that, I wouldn’t expect too much change until next week’s report. The long-term computer models are predicting some ominous storms on the horizon, and I am not talking about winter fronts. We are getting closer to October. Water temps are holding around 86 – 88 F, with the surface warming up more when the wind is down and the sun out. The cooler water is causing some green water in areas. The winds are blowing often, but most days were fishable — even though very few boats were out. Believe me that you want some wind out there to keep things cool(er)! The skipjack must have still numbered to a million at times. Some small yellowtail are being caught deep. There are decent numbers of Striped Marlin scattered around, but one or two a day is about the norm. 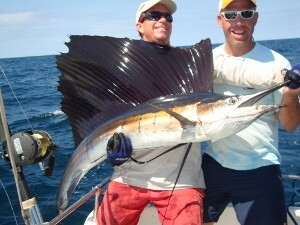 We did release a sailfish the other day. 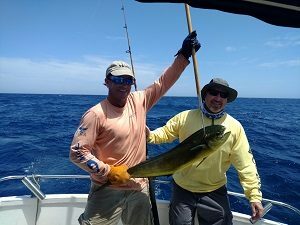 A few small dorado are around, although a friend did catch one of about 30 pounds around a bait ball out in the middle. There is no debris in the water this year from storms. We freed a turtle that had been dragging around a few buoys from a crab trap, after catching a few dorado around it first. Some small pods of bottlenose dolphin are out there. In close the bait is pretty limited, but it will turn on in the next month. The catch is consistent, and it should continue to pick up over the next few weeks. The dog days of fishing are upon us. I am looking forward to the great Fall fishing, but it could still be a month away. One friend found a seaweed line 24mi. out the other day. I don’t know the size of the pieces, or whether it came from the other side. It did have a lot of small dorado. I think the bigger ones are going to be on the other side for some time. We did have a good push of cooler water come in from the west, but maybe the tides will slack off a bit until the next full moon, or a good storm. I didn’t hear of too many reports this week. Some yellowtail and bonita are being jigged up from down deep. My clients are ready to try, but I am sure that I will hear the “w” (work) word within the first 10-15 minutes. We tried briefly in close, missing a few dorado. I am sure the marlin are around, but not yet in good numbers. I did see one monster 14′ manta ray, of which I’ve only seen one other true giant. There were a million skipjack out there, but I didn’t see any other bait. In close, there is some activity starting up. I have only caught a few triggerfish in the Bay, but on the west side of San Antonio there was a lot of bait over the weekend. The bait will start showing up, and you never know when you could find a hot bite or area. It’s feeling warm again, but there is usually a breeze to keep it bearable and the water is refreshing. We look to be in the clear for a week, but the monsoon trough is showing some waves. I don’t want to say anything, as I think I jinxed my in-laws in North Carolina by saying things looked clear for them. We don’t get too many years without at least one good storm coming through. Over 40 boats entered into the Dorado Derby this last weekend. I am not sure how many went out .. or made it through the day. The winds were up and we weren’t running past six miles. By twelve miles we were watching peaks and walls of water all over and my friend looked like he was contemplating how to check out of the situation. I am sure that there were a lot of cases of mal de mar, and probably some ‘singing’ from the ‘mariachis’ on many a boat. We hid out at the Island for a few hours, as it just wasn’t worth it. 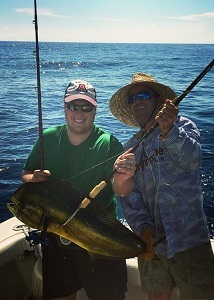 It was worth it for the winning boat to bring in their 11.6 pound dorado! They took first place and the jackpot. One friend heard that a 25 pound fish was weighed and supposedly didn’t weigh their 18 pound fish. Another boat was loaded up with winners, but the boss didn’t want to leave the action and they arrived late. Third place was only 10 pounds. There are a lot of small ones out there, and obviously not many decent ones very close. The boat that had the big ones reportedly found similar action days before at 30+ miles. The cool water is coming in closer, which is most likely where the fish are. We were out on Friday to find a lot of flying fish in areas. One ‘tournament winner’ hit, but didn’t stay hooked up. Some boats were 25+ miles out to find lots of action, but mostly smaller fish and greener water. Strong color and temperature breaks are present out there, so it’s a matter of finding the right combination. A few sailfish and marlin are around, but not many. A few small Blue Marlin were caught, which is a promising sign. Water temps are cool in areas and the current was moving. I still believe that the larger fish are on the other side where the cooler water has bait a little easier to catch than flying fish. The larger fish may also be lower in the water column a lot of the time. We barely saw any dolphin, so obviously they didn’t think we were in a good area of the sea. The Skipjack were on fire Friday, but even they thought it was a little rough to be feeding on the surface Saturday. Inshore seemed to be pretty stirred up most of the week and I haven’t seen signs of bait in close. The forecast has some cooler dry west winds predicted for the week, so maybe we are starting to see Fall begin. The storms have been forming a little to the west, but we will slowly see that pattern creep and turn in our direction. We aren’t in the clear yet, and you don’t need to break out any winter clothes either. Check out this video of the Dorado Derby by Rada SC. The fishing can only get better, I would hope. I see some cooler water in the mid-80’s reaching past the Island and Reef from the west, so hopefully there are a few more fish there. It has been pretty slim, but I think most boats weren’t going the distance. I could blame it on the full moon and lack of current, but I don’t think that would be fair. One friend found a couple dorado 25 miles out. We tried a few hours in close Saturday and Sunday for only one small dorado. It was about the equivalent age of the young man who caught it, so I threw it back to grow. Some big skipjack are crashing in close at times and lots of smaller ones are around. I haven’t caught anything besides some small triggers and snapper on my morning walks. The bait does not seem to be around, so why would the big fish be here. Things look a little rough for the tournament on Saturday, but there is time for the forecast to change. Always check the local radar in the morning, because as it did on Monday, those toritos can build overnight and still pop up the next day. Some can pack as much punch as any tropical storm. A quick check, and you can usually see if any weather is on the way that may have been easily missed by a previous forecast. I’m not holding my breath on anything for the next few weeks. I wouldn’t expect any game changers too soon either. Will the ocean ripen up for a big storm in late September, will we see any more rain until then, or is it just going to be a long warm Fall? We are getting nice days on the water with some gentle breezes. It’s not overly hot and humid. The ice is keeping the drinks cool and I will patiently be waiting for the next bite. It’s hot in San Carlos, and unfortunately I am not talking about the fishing. We made it back from vacation and got out a few times around the weekend. The other trips were just half days. Sunday we finally had a marlin come up that we got to the boat. It was a nice fish of about 130 pounds.The day was so flat that I don’t think the boat ever rocked. We had some relatively cool and shaded days. We did have a handful of bites over the three days that I believe were sailfish, that I heard just weren’t hungry. The other report I heard from the last couple weeks was of a few small Striped Marlin being caught. 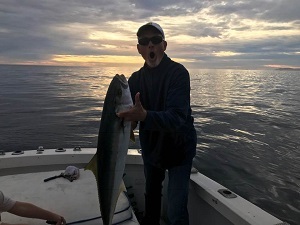 A few dorado in the teens have been caught, but not many. Another thing said was that the millions of skipjack out there were feeding on larval crab, so maybe a lot of fish are stuffed up with them. The currents seemed light, so maybe the full moon will stir things up. Speaking of crab, or langostina, I had some of the tastiest crayfish that I have ever eaten, down in El Fuerte. These crayfish were giant and delicious! The shrimp too, though small, were extremely delicate and flavorful. I have to give credit to the chef of the Hotel Torres del Fuerte, the sister operation of our local Bonafacio’s Restaurant at the old Mirador RV park. Maybe Sinoloa doesn’t allow their legendary crayfish to leave the state, so you should definitely make the trip. I jokingly ducked as I crossed the border, but I never got shot at or saw a gun, contrary to current media hysteria. It was very beautiful down there and ‘relatively cool’. The hotel is over 250 years old, but I believe just the inner bricks. It is in perfect condition with gorgeous spacious rooms with a colonial layout. The town was lively, but dead quiet at night. There were a few places we drove by that I would definitely like to explore, and the trip up the Copper Canyon looks like a great adventure. We were formulating plans to bridge our two areas for the guys and girls, but of course there was a lot of talk about fishing and hunting. The options and activities are numerous, so stay tuned. I think that I could go just to eat though! The Dorado Derby is coming up at the end of the month. Hopefully the weather is good, because I think we will need to fish out in the middle to win. I haven’t seen much action along the shoreline, but there is bait in close. If you want to catch Skipjack, then this is the place to be. Sorry for no reports the last couple of weeks. I really didn’t hear a thing, so it wouldn’t have been much of a report. We were in Steamboat for a couple weeks. I caught beautiful trout in the tailwater pockets of the Yampa on big dries, and many nice trout out of Steamboat Lake. Not enough of a freshwater fix for me, but I am not shaking too much with these temps and all the water here. I think there were pretty limited trips this week. We were out on the full moon, hearing nothing, but maybe the bite was midday. The currents did seem strong. I saw one friend caught a few nice dorado. Another friend returned with several marlin flags, a sail, and a dorado flag. There is a stationary school of bait just off the point west of Carly’s Rock that probably has some fish around it if you wade out. The action sounds well offshore. Some cooler and flatter days… if you pick them right! Summer has settled in. Water temps are pushing 86, and will probably be 88 after a full week of south winds forecasted. Hopefully some rain will be in the forecast to cool things off at times. The weather was bearable last week — and on that note, remember to get your sunscreen on before you exit your vehicle. Half days were productive for us this last week, with some small dorado and marlin in close. The dorado were 6 – 10 pounds. 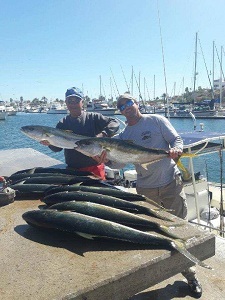 One boat had a couple good dorado catches during the week outside the Reef and then west of San Pedro. A few small tuna were caught. Huge schools of skipjack were outside the Island with some big ones scattered around. Billfish outside were sparse. There could still be some good catches at times, but don’t set high expectations. There doesn’t seem to be a lot of bait, but maybe after a week of wind and the full moon the currents will stir up some fish. 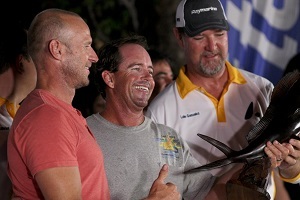 The 71st International Billfish Tournament was last weekend with 26 boats competing. Mornings were pretty nice and cloudy, with afternoons a little sunny and warm. You need to wear breathable shirts that you sweat through to keep cool. Either that, don’t work at all, or bring a dozen cotton shirts. Still, we are getting a lot of nice ‘cool’ and cloudy weather. Just watch out for a hot bite! The tournament boasted some great prizes this year, drawing a crowd and revamping the popularity of this historical tournament. Strangely, all the big dorado stopped biting for the weekend, leaving the $2,000 USD dorado jackpot to roll into next year. A few met the minimum weighable weight, with the biggest at 24 pounds. We did catch a handful of 8 – 16 pound dorado each day. 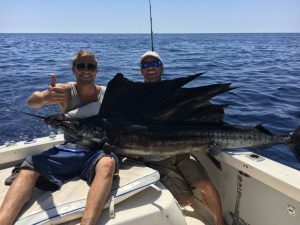 There have been some big sails at times, and not a lot lately, but no one weighed a sailfish over 70 pounds for the motor. The grand prize was for a truck with a 200+ pound marlin. We had the big gear and 16 – 20″ lures out. We ran a lot of skirted ballyhoo too, which got the bites, but our catch ratio was off. The dorado were stuffed with crab, and the billfish too were dropping baits and just not taking them down. Still, I had one good fish that I slowly cranked in before strapping on the chest and bucket harness. I inched it up to a stalemate 50′ under the boat before the hook pulled. I heard of one other good fish lost, and I’m sure there were others. There were a few reports of Blues lost and released last week. The radio communication was tough with the humidity, our stereo was up, and I haven’t seen the results, but Telamon won with about four marlin and a sail release. The bite has been tough at times. Some fish are being found in close. The shorelines are cleaning up. The backside of the Island seems to be the area at the moment. Some wahoo were reportedly lost. Look for the birds and the current rips and you can still find some red hot action. Just bring lots of water, Gatorade, Electrolyte, sombreros, and shirts! The summer fishing is still good. Not to say that every boat is catching, as always. A few boats though put up the best fishing in decades! They say that currents are the key to good fishing. A strong current curved towards San Carlos coming from the south in a rare clockwise gyre and it brought fish and some seaweed. Things have stayed relatively cool with lots of fairly flat days. It’s been pretty good even if we weren’t slaying them. There is some good bait around. Most fish are full of crab, but they have also been finding squid, ballyhoo, flying fish, and little fish around the seaweed. The beaches cleared up significantly of seaweed after some high tides and big swells. It should fuel a lot of bait development that could keep the fish around. We found one school of nice dorado just a few miles out. The shorelines are pretty dirty, but there should be some fish in close. The blue water was pushing right up to the points. Some good schools of marlin were found where boats had to leave to get away from them. One Blue Marlin was caught and a few grabbed hooked dorado. The sails weren’t too thick. 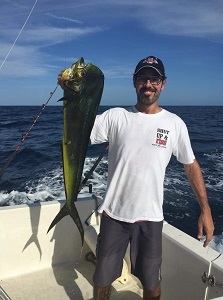 The dorado were mostly found 20-30 miles out, with lots of 40 pound bulls caught. Many limits were had. There is still some sea life out there. We were within twenty feet of a large Fin Whale. We saw them several days. A few pods of dolphin are out there. The turtles were thick at times to where you really needed to watch where you were going. Find the life and you will find the fish. It definitely might be a summer to remember. There are a few big dorado out there! A nice surprise has been wahoo. Usually a very rare catch, there may have been a handful or two caught in the last ten days. We picked up a 40# wahoo, followed by a 40# dorado on Saturday. Add in another dorado and four sailfish, and we had a good day. We were definitely eating well. Not to say that our day wasn’t more of the exception though. I really only heard of a few 40# dorado caught this last week, out of dozens of trips taken. 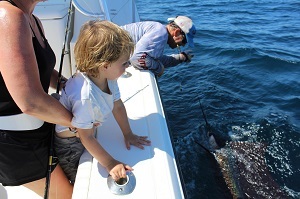 Most boats have released a sailfish or two a day, with a few small dorado being caught. I’d fish ten days for a chance at a 40# dorado though. A little bit of weather lately, but still some nice days and not too hot. Are the tuna next??? Summer is still settling in. Water temps are threatening the mid-80’s some still afternoons. We are getting some cooler 81-83 degree water, keeping it pretty nice out there. The wind is coming up at times, with mellow afternoons. We had a one day tournament on Friday with the Wounded Warrior’s Organization. As with every tournament this year, a day was cancelled due to the port being closed. It did get windy this time. We had a nice day Friday, with some boats releasing up to six billfish. The guys all caught fish, and we didn’t have to test the endurance of their sea-legs on Saturday. Shots restaurant made us some great breakfasts and we had a nice dinner at the Yacht Club. 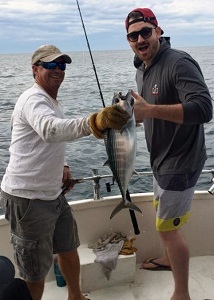 Wednesday and Thursday saw a few football tuna being caught. I even heard of one caught two miles out. A good dorado school was found last Tuesday. Some days are thin, but some days a few are found, and there are some big ones to hope for, … and to break your heart and/or line. One Blue Marlin of around 300# was released today. The best fish numbers were around the Reef and just outside, but now seem to be 22-26 miles out. We may have had a wahoo bite us off in the tournament. 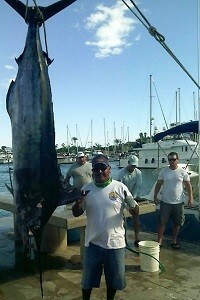 One of our marlin was about 170#. Inshore, there is some bait in close with a few bonita, skipjack, and small dorado. A few corvina are cruising the shorelines. A few mantas and sharks are still around. We saw lots of turtles one day. There have been some dolphin around, and one rare albino Risso Dolphin was seen. There are a few days of wind here and the full moon coming, but that won’t stop the fish from biting. Things have changed a bit in the last week. We were getting fish within a few miles, but the rain kicked up the green water which pushed far out. It seems to be clearing up though, with the blue water currently about 14 miles out. 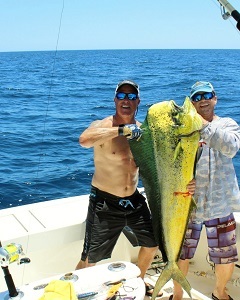 A few good dorado are still being caught. Not a lot are being caught, and the seaweed is mostly gone, but even one or a few can make for a good day. There have been a lot of billfish around at times. The sails and marlin are starting to bite good. Many were on the Reef, but now they are scattered around farther offshore. Maybe soon we might have some Blue Marlin in the mix. Inshore there is a lot of bait. Skipjack are the most plentiful, but there are a few bonita in the mix. With the bait, will come more predators. I’m sure some small dorado will move in soon. We’ve seen all sorts of life lately – dolphin pods, turtles, sharks, whales, mantas, and more. Expect some good weeks of fishing ahead. Summer is here, now it’s time to find the fish! As we settle into the season, the fish settle throughout the sea. They are also settling throughout the water column. Then you need to get them to bite! They were biting early in the week before the full moon. On Tuesday, we had one angler out and he was done after four sails. They were coming up in packs of a dozen around noon, slurping down tiny baits. There were lots of Thresher Sharks jumping. The marlin were tailing, but not biting. I had wanted to get to the Island that day, and sure enough one friend said he had non-stop jigging action all day. Some of the yellowtail were large, with some smaller ones around lately. That evening, friends said the langostina crab came up over a large area, possibly after the sardines. The dolphin and birds numbered over a thousand each, joining the food-chain fiesta. Then things got a little tougher. The currents were ripping with some billfish jumping in close Wednesday, but the sailfish packs weren’t coming up. Maybe Tuesday evening’s pre and full moon party wore them out! 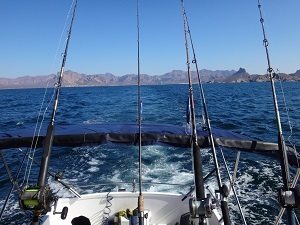 We thought that maybe the sailfish had shifted to off Guaymas and Haystack Friday with the northwest winds, losing one there Friday. The winds let up Saturday, but that didn’t stop the Port Captain from shutting down another tournament. Anything over 3 feet and they close the port these days. I think we found the sailfish on Sunday, but couldn’t get more than one to come up from the bottom of the bait balls. 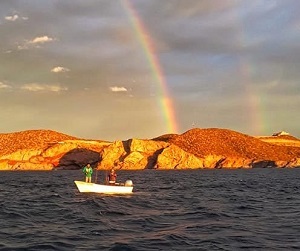 Most all of the other 20 boats in the Rescate tournament headed farther out, where a consistent bite of a billfish or two and a few dorado had been found over the last few weeks. Maybe a third of the boats released a billfish, with a handful of dorado topping the weighable 12# mark. The winning fish was 24.8#. A couple boats released two billfish. A few marlin gave some good battles. Baby Girl managed to find the hot spots and clearly won with five releases for their first major win. There are a lot of seaweed patches floating around. Not all seaweed is the same, and I think the most important factor is where it’s been. We are still finding dorado that don’t seem to be hungry. I think we are not seeing a lot of the fish out there. The bait balls aren’t concentrated on the sargasso and are on the move. Some patches were loaded with dorado, but the greater majority aren’t. Most are just a nuisance, but then you find that pot of gold where the party is at. I did hear of a few tuna caught. We saw one more pod of Humpbacks fly by. 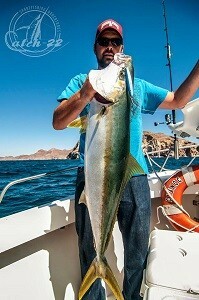 I saw a lot of nice wahoo and tuna photos from the East Cape of Baja, along with plenty of 20-30# dorado. Although it seemed like the peak of the action could have passed, the full moon will wane and the fish will be hungry again soon. The currents should pick up again, creating upwelling and good temp breaks left over from the cool winter. Storms and winds are changing directions, bringing in sargasso through and from far-off productive areas. It may be getting a bit warm, but the fishing too should still just be heating up for the summer season. The fish are in the water somewhere and they have to eat to survive, so keep on fishing. Winter is back? The northwest winds ramped up for the weekend cancelling the Ladies’ Tournament. It sounds like they might have a fun fish day Wednesday though. It could be windy for the Rescate too, but the Port Captain and marinas have “cried wolf” for too long with their red flag warnings (that often get left up for the week). There might be a revolt! The party boats just wait for numbers midday to leave in mass to disregard the closures. Mutiny is in the air, as I think the sailing regatta decided Sunday. Saturday was ugly though, and a good call was made (a little late!) for everyone to return to port. Even the fish didn’t want to bite it was so rough. The fish are there! Thursday we saw our first sailfish jumping. 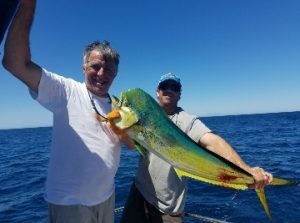 We passed a big school of dorado and could only get one to bite. I’m sure some very small lures would have worked, but we kept moving. The marlin were biting good just outside them! We went farther out with minimal results. Coming back in, we saw one group of birds with half a dozen sailfish. Still, we could only get a few to bite. Then they stopped coming up. Same story up to the present. Very strange indeed! I have seen it before, but usually a few bite…and they are. I don’t know if I’ve ever seen dorado not bite. A few will attack, but they are so full they won’t eat what they just killed. 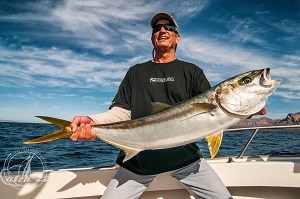 Same as the yellowtail at times this year, they just want the tiny 1″ bait and go for the whole mass and inhale. They’ve got it good, but things will change and the bite should explode soon. If I had a tuna tower or six figure fish finder I would see the fish. I don’t know if the monster packs of sailfish have shown yet — I think we need the south winds predicted to start next week, but there are very healthy numbers of billfish around. They aren’t big, but things are looking good. The dorado are good sized this year! I hope that I didn’t see the only “party” come and go. Last Monday we hit another good patch, but the fish were twice as big as the day before! I threw a popper with the first 30-40# bull barely missing the hook, to be followed by a 28# bull grabbing it. I saw over a handful of 30-40# dorado out of the few hundred there, with lots of 20#ers. They were turning and some fishy love was definitely going on. It wasn’t about the bait at this party ;). We saw bigger paddies the following days with decent bait, but the fish weren’t under them. We saw and caught a few chasing flying fish, accompanied by frigates. I haven’t seen that in a couple years! It’s the best show on the ocean, for me. 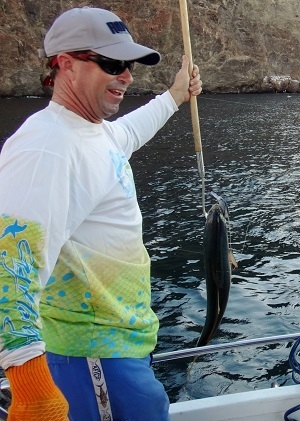 I think the greater dorado numbers showed midweek along with the sardine balls, but most of the fish were down deeper. Everyone was talking about how they wouldn’t bite. Give them time! I’ve seen every bait out there – squid, crabs, sardines, flying fish, and tons of ballyhoo in close. The big fish were in close too! We caught a sail just four miles out. The fish pushed up with the current towards the Island, to the west, and there is some good fresh blue water around the Horseshoe 18 miles south. The billfish weren’t tailing, but everything was riding the south current casually following the helplessly fleeing bait. There’s not too much in the way of marine life. There are a few Thresher Sharks jumping, some Hammerheads around, and the occasional manta and turtle. The large dolphin pods are not here yet, which is a sign that the real action is on the way. So, one last round of winter winds and kiteboarding. I put the short wetsuit on yesterday, as I attempted to further injure myself under the kite. Good call! I read down to 70 degrees this morning! We caught some nice bonita at San Antonio!!! We will be trying for yellowtail in the next few days again. Some friends did get some at Pando up the coast. We will try the Island. I couldn’t get any at the Seamounts, or anything off Honeymoon – even with a little break in the seaweed harvesting. One friend did get some nice cabrilla up the coast, one very large Golden Cabrilla, and a healthy grouper. Not sure what the guys are pulling up in close bottomfishing, besides a buzz. I’m sure the baby red snapper are biting. The shorelines should have some action. I saw a monster needlefish at Honeymoon today. There are lots of baby pelicans there. We stopped by San Nicholas and I counted twenty Blue Footed Boobies. Summer is here! Water temps on Sunday were up to 78. I’m ready for an offshore swim! Temps were in the low 70’s in areas, but mid 70’s offshore most of the week. Breezes kept things cool, but it is starting to feel warm when the wind stops. Nothing like what those poor people on land have to experience. The water is clear and the fish are biting. We went to Tortuga Island 54 miles out last Monday. The trip started off with a marlin just five miles out. My friend had an old rod and Penn Senator 6/0 with some 200 pound dacron, and sure enough that is what it hit. We picked up a pair of 16 pound dorado in the middle for ceviche. Tortuga strangely was bare (or fished out) of cabrilla and pargo, and we only caught skipjack trolling. We didn’t have any luck with the yellowtail, but we sure caught a lot of huge triggerfish. It was necessary to hide out from the wind a bit the second day, and we only managed to catch one small dorado. On the way back we caught another nice 16 pound dorado. About in the middle, with one friend asleep, I saw a monster dorado swimming in front of the boat. I casted a popper near it, right as it started to head into the spread. It turned and tried to stun the popper, hooking itself in the head. I must have chased and fought the fish for a few hundred yards from the bridge before my buddies got the lines in. It took a half hour, but we managed to catch that 40# bull! After that, we didn’t even mind barely missing a few marlin on the way in. Good numbers of marlin were in close on Thursday where we found some hungry fish. A friend caught two farther out. The last few days it seems that they are not biting as well (the New Moon?) Our clients got called into action today when we found a school about 50 dorado under a large seaweed patch. We kept about six 10 – 14 pound bulls. There is more life here every day. We’ve seen a few Thresher Sharks, turtles, and mantas every day. I’ve seen a couple groups of Humpbacks and I’m pretty sure a pair of the Curvier’s Beaked Whale. It’s a good time to be on the water! Summer is here, but there is still a transition. It’s going to blow again from the northwest for a few days, so things will be cool and dry. I am not sure if we will see any final showing from the yellowtail. Water temps on Sunday were up to 78 and fairly clear. 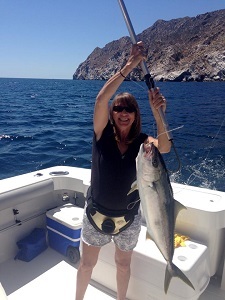 There are some decent Sierra and baby yellowtail in close, and I heard of one Bonita caught. A few small dorado have been landed. I believe that we released the first marlin of the year today! We had one on last Wednesday shortly and found one small area with a handful of fish, though they just tickled our baits. For the most part though, there are not a lot of fish out there. I haven’t been seeing any bait offshore. We did see a couple Humpbacks and four Orcas last week. The weather has been pretty good and the air not bad, so we are patiently waiting for the fish to move in. It looks like we are finally transitioning to summer. Water temps are approaching the mid-70’s offshore. A few marlin are being spotted and a few dorado were caught. I heard of one reported to be 18 pounds. I’m hoping to eat some Mahi Mahi tomorrow! We’ve had a lot of nice days. Some cabrilla and pargo are biting. We lost a big one at Deer Island. 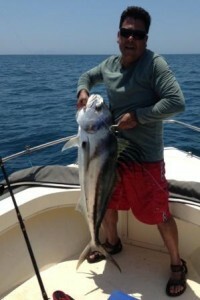 A friend caught a nice cabrilla at San Pedro, and I saw a Golden Cabrilla caught there. No signs of Sierra yet. We tried the bottom today, but it was pretty slow. The Island had some limited bites on jigs and good late popper bites. The yellowtail were still often focused on the small baits though. In close there were plenty of yellowtail, but only about 2 – 3 pounds! There are huge bait balls around, but today they had mostly moved off, with no surface activity. It’s warming fast with south winds in the forecast daily, so besides jigging at the Island, we may be looking for the summer surface fish from now on. It is getting warm, but summer isn’t here yet. There was one solid sighting of a marlin in close. They migrate in numbers, so who knows when and where you could see multiple fish in an area. Other sightings may have been manta rays. I thought I saw a nice swirl on Monday, but I’m sure it was just a turtle. The fable must be true, as I saw lots of turtles. The warm currents are coming in, as they don’t swim that fast. Maybe some marlin beat them and have already swum through. I didn’t find bait, which is probably where the pelagics are. We passed the pod of a thousand dolphin again, which must be eating up a lot of bait. The water was 75 and clear with some bright orange sargasso, but no dorado. Inshore action along the shorelines should be picking up. I didn’t hear any bottomfishing reports. A few good yellowtail were found in close, but mostly just babies. The Island was good Wednesday and late Thursday and Friday, and then slowed down. Many were filling up on crab and sardines. Some probably spawned, but I think we still have another good month of fishing for them. We might have a few slow breezy days here, but you certainly can’t complain about the weather right now. I wasn’t going to ‘talk’ yesterday, but I will now. Some boats have found some good jig bites at the Island, but we found a hot spot for the poppers. I think maybe my clients left too many in their mouths and they were a little smarter today. On Tuesday we were getting them pretty good on a deep trolled 30′ Spotted Minnow Rapala. Some big boils came up but didn’t stay up for long. Beautiful seas with clear warm water. We will see marlin within the week. I did see a Sea Ray, manta, and shark today. Lots of dolphin out there. 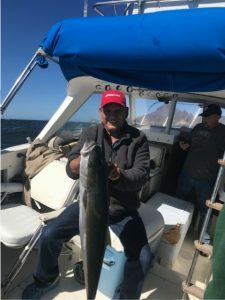 There are some good yellowtail in close off San Antonio and the Mirador, but we didn’t get many to bite. They are on the feed, so get out there! The yellowtail blew back in. Last Thursday it was up to 72, clear, and we were looking for marlin. On Tuesday it was back down to 67 and green, but we were seeing decent numbers of yellowtail. A few were going to 20 pounds, and the smaller ones were 7 – 9 pounds. I did see a few lost flying fish. The fish were chasing small bait, with a number of boils. We caught them on small jigs and Rapalas. 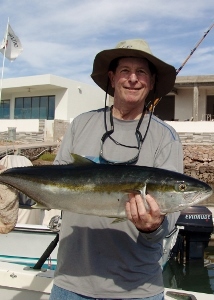 There are great numbers of large yellowtail at the Island, but they were focused on small bait. We only fooled one, but that could change. I didn’t see the pangueros catch any either. Hopefully we’ll have a few good days out front. I don’t expect the pelagics to move in too soon, although the water should warm a bit at times this week. They finally started to see good marlin numbers to the south, but they were full of squid and didn’t want to bite. They have been getting some good dorado and tuna. I think the cooler water is setting up the sea for some good bait numbers and a lot of sargasso for the summer. The bottomfishing was good at times, but pretty variable. There was a pod of over a thousand dolphin around last week. They had acres of mackerel balled up under our boat one day. I never get tired of seeing the babies next to their mothers. We saw a dead Cuvier’s Beaked Whale. I had never seen one before. It hadn’t been dead long. I guess they can dive to 10,000’+. They are in all the seas and number over 100,000. On a last note is some slow fishing for the World Offshore Championships in Costa Rica, but there are still two days left. Some inshore fishing looks to be starting up. No excuses now, so get out there! There’s lots of change going on. We had some nice and bad weather, and some great and poor fishing. Some small dorado were seen 25 miles out. We headed to 24 out one afternoon to only find bait balls. I got excited when I saw a few splashes far back in our wake near sunset, but they were just a couple of dolphin chasing bait. The water is up to 72 degrees in close, and 74 farther out, so I think we’ll see a marlin before the next front blows them back south Friday. 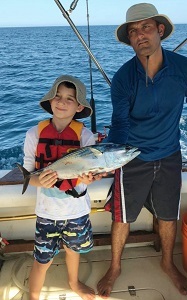 The yellowtail continued to bite good last week, although most were very small. We did get one about 16 pounds on the surface and a friend jigged up a few that size off San Antonio. We lost a couple nice ones at the Island, and they were all over, but focused on very small bait. I saw a few at Punta San Pedro and Pando, but they too were only looking at the tiny anchovies. They were in thick in places just off San Carlos, with the terns creating quite a racket. There are lots of barracuda around chasing them. There are very few yellowtail around at the moment, but they will be back, if they aren’t just all full hanging out down deep. The bottom fishing for calicos is pretty good at the moment. One seal enjoyed a few of our fish today. We have been bringing up a good variety of fish from the bottom of decent size. 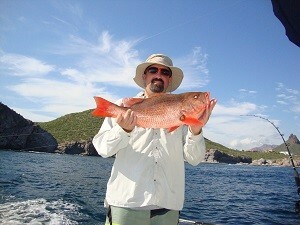 I saw one nice inshore snapper caught, but I haven’t had luck in close. 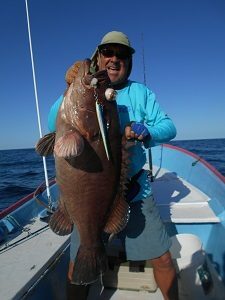 It should be time for them to start biting, along with the cabrilla and Baya groupers. The seaweed cleared out at times, but it is growing like crazy along the coast. I marked stalks that were 20′ tall. The visibility must be 50’+ at the moment. My group today somehow stayed in snorkeling for 20 minutes. I would have given myself twenty seconds though. We were treated to a nice massacre, as over a thousand dolphin piled into massive schools of mackerel and had themselves a feast. I’m sure it was as exciting for them, although the mackerel weren’t having a good day. Spring is in the air! It is feeling warm, with the water quickly heating up. Surface temps have shown into the low 70’s not too far out. In close I have seen 67, with some clear water. With the forecast, we could see some marlin soon. On Monday we had lots of small 6-10 pound yellowtail coming up. There were boils all over off San Antonio to Doble. A ton of ballyhoo are on the surface. The birds were very active! 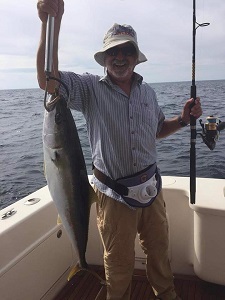 Some larger yellowtail have been caught at the Island. It should be a good lunar cycle as they fatten up for the spawn. Reports of bottomfishing have been good, with a fair amount of grouper. The yellowtail were smaller Tuesday, but we caught one close to 12 pounds. The current is moving, so expect good changes! At least we were putting food on the table last week. Some fair catches of four were had at the Island, some just two, and some … none. I didn’t hear of too many big ones. Friends caught five there yesterday of good size, and mostly on surface bites. There is some good bottomfishing there. Things will be improving. The fishing in close has produced a few fish. I caught a couple a morning over a few days late in the week and they were 12 – 15 pounds yellowtail. A latest report was of just a few small ones. The wind has been up a bit. It looks to be windy until Saturday, and then things are going to warm up. A lot of 1 pound Sierra were netted in the Bay. There are also rumors of tuna, with one reported seen to be brought in, most likely by a sailboat that crossed. The water looks clear and warm enough out in the middle, with reports of tuna off Loreto. The southern current looks to be battling El Norte. Change is in the air! The fishing picked up a little last week. There were a few good days had at the Island, jigging up some nice yellowtail. The bait thinned out and got a little bigger in close. We had a beautiful day Wednesday and caught four of five trolling off San Antonio. Most of the yellowtail were 8 – 12 pounds. The next morning we picked up several, with one about 17 pounds. I heard of a couple better catches and one to 19 pounds. Sunday we caught several, but they were small. They were boiling though, which I hadn’t seen in a month. It should be good the next few days as we come off the New Moon. The weather looks better too! The winds have been consistent, kicking up cold brown 60 degree water and lots of seaweed. The clearer water outside the seaweed lines have held the fish lately. Some fish are coming to the surface, but deep is always productive. Hope that you get some for the table! 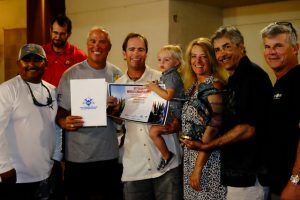 Shots hosted the 12th Annual Yellowtail Tournament last weekend. Thirteen boats fished the worst tournament ever. The weather was at least good on Saturday, where Fins Up won the tournament with six fish, and the biggest at 26.2 pounds. Only four other fish were caught that day, and seven on Sunday. Fins Up caught two other fish for a total of 151 pounds. 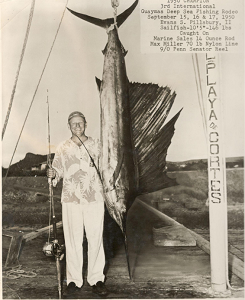 The next biggest fish were 22.2 and 20 pounds. I think everyone still managed to have fun though. 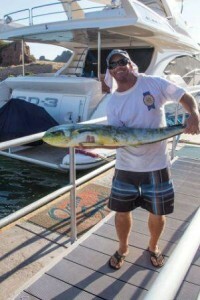 We were able to catch our first yellowtail in a month on Tuesday at 10 pounds. Another boat caught three before we got there mid-morning off the Mirador. The seaweed was thick and so was the bait. I thought I was marking fish in close on Saturday, but they may have just been barracuda. I do believe that I have never seen so much bait in the water. I have a feeling though that it is all larvae sized baitfish. I recall the same thing last year and then good numbers of yellowtail moved in when the bait got bigger. A few Fin Whales came through and one big pod of dolphin. The water is still very cool at times and turning over. It may be like that for some time. The surface did hit 72 in the middle on Saturday, as that sun is getting stronger. Pando and White Rock produced a few yellowtail and some good nearby bottomfishing. We had decent bottomfishing on Wednesday off San Antonio, and then it slowed. The Island was pretty good trolling on the surface Thursday before it shut off. My friends managed to catch six good yellowtail that day. Looking like some windy days this week, but we’ll be trying to put something on the table. There are tons of fish out there, unfortunately they are mainly just baitfish. I heard of a few yellowtail caught. One report from the Island was of tons of crab and only one yellowtail caught. 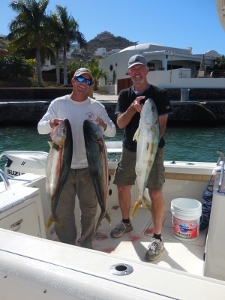 A couple yellowtail were caught around San Antonio. Up the coast sounded slow too. We marked bait all over on Tuesday in close. The water has cooled to the low 60’s. It was colored in close, but is quickly clearing up. Looks like a windy week, but hopefully they will be ready for this weekend’s tournament. A few nice yellowtail were caught on the Seamounts on Monday trolling, with fish coming all the way to the surface. My friend caught a handful weighing up to 20 pounds. The bite was early on Tuesday, and then the weather turned. The Island was producing a few fish. Up the coast at White Rock there were a few larger fish and good numbers of small ones jigged up. It was a little rough for bottomfishing most of the week. There’s lots of bait around and also some Fin Whales. Looks like we’ll have a few rough days and the full moon could be a factor, and then expect the bite to be good … hopefully. Winter is taking a stab at us, although warm water is getting pushed up from the south. It’s not warm enough for marlin or tuna I believe, but maybe things aren’t far off. For the moment though, the winter fronts are kicking up the seas. There are not any great reports, but some fish are being caught. For example, there have been some 3-4 fish catches from the Island jigging and trolling. Up the coast I heard of one good and one poor report. I’ve had mixed reports from the bottomfishing. 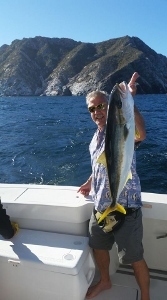 I heard of one report of yellowtail found off San Antonio deep. Finally, a few big ones are being caught around the Seamounts. We did see a few short boils there. One good sign was the amount of bait there. It should be a decent moon phase this week when the winds let up. The fishing turned on over the weekend for some good afternoon bites at the Island. The big fish were caught trolling near the surface. Monday was slower there. 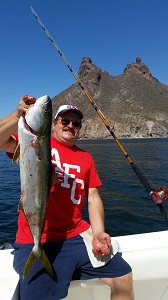 A few smaller yellowtail have been caught off San Antonio in deeper water, but on the surface. The Seamounts still didn’t produce for us. We saw a lot of scattered birds diving on our way to the Island. Sometimes the fish are offshore this time of year. The water has cleared up and warmed up. We read up to 67.3. Maybe the marlin and tuna could show within a month. Up the coast the water is cold and dirty. I think we’ll start to see more bait and overall activity in the next two weeks. The fish sometimes swim through in waves. It seems that good bites only last a day or two usually, so get out there and make the reports rather than wait for them! We are still getting excellent weather conditions. Someone should be out there water skiing! A couple days of wind are predicted, and then we’ll have many days with some south winds in the forecast. I think we are over the hump of winter. They are getting tuna not too far to the south, with the other pelagics never having left the Cape. Spring is right around the corner. A few fish were caught at the Island and up the coast. The best bite came to one boat trolling 20’s on braid. Maybe the fish were higher up feeding on the crab. They found the fish full of them. I spent a few hours today ordering up red lures. We will see. The crab are easy pickings when they don’t want to work hard in the cool water. 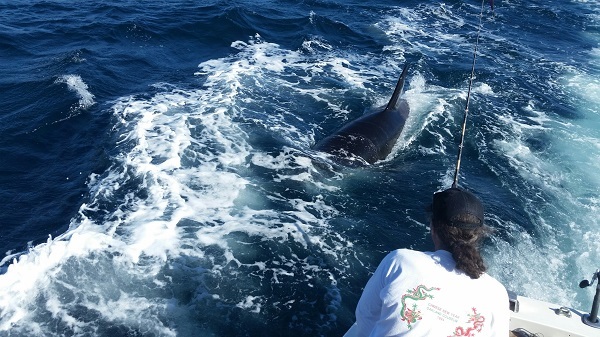 Bottomfishing may be your best bet in close, if not whale watching. The reports of larger calicos and more grouper were improving, especially with more boats fishing the bottom in perfect conditions. I found good readings at the Seamounts, but maybe they weren’t biting. Some yellowtail were jigged up off San Antonio. We did catch a very early season Sierra. A number of Fin Whales are stationed right off San Antonio to Deer Island. There were lots of bait readings that I suspect are small baitfish. Just look for the thousands of Grebes and the spouts. Maybe the yellowtail will join the party. Maybe we are in the doldrums of winter. Some exceptionally cool and dirty water popped up Monday in the Bay, which wasn’t produced by our cool air. I saw and heard of only a few fish caught off the Seamounts. San Antonio still seemed quiet, as well as Haystack, and even the Island and White Rock produced only a fish at best. One report from Tortuga Island found some yellowtail. 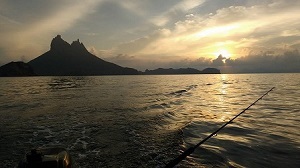 Very few reports were coming in as very few were fishing, in accordance with a poor bite predicted by the solar-lunar tables. Maybe a midday bite will materialize on the full moon, and then it should be slow for a few days. It is the time to get to the bass lake though as the largemouth should be spawning. This is when the big ones are caught. They have to wait until June in places up north to fish the spawn, so don’t worry…Spring is right around the corner. Don’t wait for a bite to make plans, unless you can go the next day… and then you still should have been there the day before. It sure seems lately that you just don’t want to plan for 3-5 days after the full or new moon. The tides are looking better this week, as well as the moon phase. Check out the bottom graphs on Tablasdemareas.com for Guaymas to see when they predict the bite times. Winds are starting to blow a bit, but mornings are usually fishable. I only heard of one report that checked out White Rock and the Island. They saw a lot of fish at the Island, but the bite was tough. I think the weather kept many from bottomfishing. I heard of a few fish from San Antonio, but they may have been smaller. The Seamounts are still holding large yellowtail. My neighbor even claimed to have caught one in the upper 30 pounds. Many of the fish there are around 20 pounds. The Rapalas deep are still working, but live bait was the best producer. I heard of one panga that caught a half ton of yellowtail! Jigs were catching a few fish, and I finally saw a few quick boils. The bite turned off for a few days, but it will pick up this weekend. If you make it out, you won’t be alone. The fish were back on the Seamounts on Tuesday. They started biting in the afternoon on the Rapalas. I heard of a few caught off San Antonio. Sounds like there are a few decent calicos around too. There were some excellent bites up the coast at Pando, but it sounded poor the last few days. The Island also had a few fish. It should be good this week as we come off the New Moon. Looks like a few good weather days in the forecast too! We had another week of great weather. It was like a lake out there on Tuesday. Expect a little wind on Thursday and Friday. The water is up to 66 and fairly clear in places. I am hearing of some decent bottom fishing reports. There’s not much action in close, although I saw green mackerel not too far out. The action in close has cooled off, but could turn back on quickly. 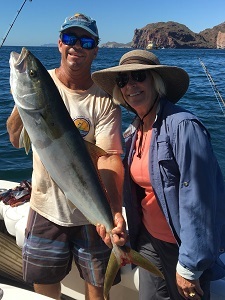 A few fish are down by Haystack, the Seamounts still have a few, and San Antonio has a number of small yellowtail. I did see a few midday boils. 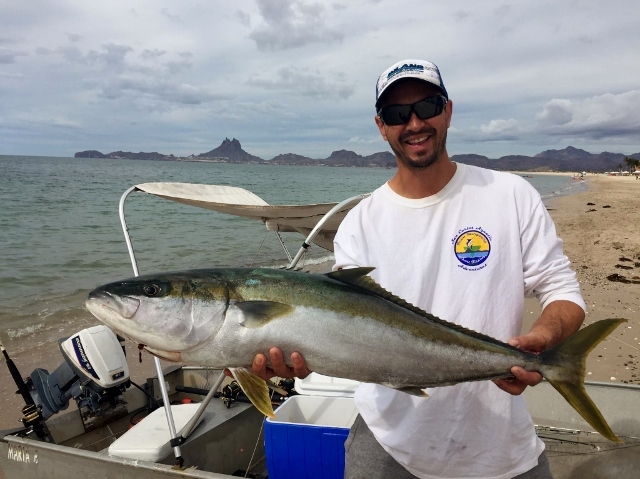 The best action for yellowtail was up the coast at White Rock and Pando. The bite times varied, and you should have been there yesterday or stayed later. There were some great catches … and some not so great catches. The Island too turned off at times. I guess enjoy the day and be glad you aren’t a commercial panguero! Feliz Año! The week started off slow but heated on up to the full moon. The yellowtail were showing the importance of the lunar phase. You can’t wait for good reports and say you’re coming down in a week. We had great weather conditions, and even a few glass calm days. It warmed up with the sunrise. The bait seemed to disappear a bit, but eventually some good numbers of large and small yellowtail showed. We lost one good grouper or cabrilla, and my friends found one bonita. Some yellowtail were caught at the Island. New Year’s Eve saw about 30 boats fishing the Seamounts, including these pangas pictured on left. Things should be a little less crowded this week! Billfish, dorado a mile off the beach, some sails are in close and way out there. A few tuna were found closer to the other side. A few Sierra and skipjack were found in close. Corvina cruising the shoreline. June: Eleven anglers came together for our Wounded Warrior’s event. Deal Maker squeezed by us with a final sailfish release. 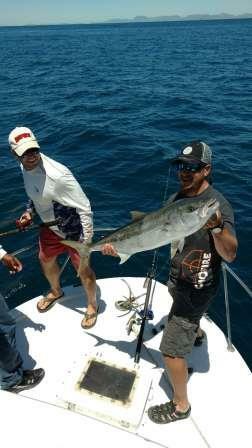 They had a sail on day one, a large 25+ pound dorado, and a 175 pound marlin. Most everyone got to reel a fish in and as always, they all loved San Carlos. Sailfish around the reef, farther offshore, and 40+ miles to the west. Some skipjack have added a little excitement at times. A few small tuna were caught outside the reef. Some marlin are in close, a big one was lost on the Reef, and there are a few farther out. A few small dorado have been scattered around. Friends have caught pago and corvina from the beach. June 9 & 10: MarinaTerra Dorado Derby with over thirty boats participating. The winning fish was only 23 pounds, but that is bigger than they have been lately. We ran fifty miles out before we found a good break. It wasn’t long before we found a nice 6′ weed patch loaded with dorado. We got a lot of nice fish, but our largest was only good enough for fifth place and a participation trophy. The other side is definitely the place to be. There were a lot of small dorado around in areas. Some folks have been going a little over the two fish limit, slaughtering the nurseries. One angler was spooled, most likely by a big tuna. There have been a few larger marlin showing. Last week’s tuna supposedly maxed out a 220 pound scale and was taped out to be 283 pounds. That is the largest I’ve ever heard of here! A few very small tuna were in the catches. Good numbers of sailfish were caught, with a few more marlin too. I have seen a good number of Fin Whales. We did have a Humpback breach a few times for us. Lots of turtles out there and a few Hammerheads. I’d expect the bite to turn on again as the full moon wanes. See you on the water! 1st place. Heriberto Velazquez, on El Fantasma: 11.4 kg. 2nd place. 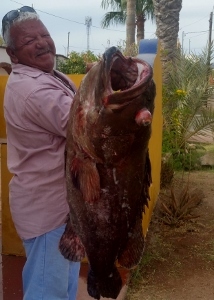 Fernando Escalante, on La Revancha: 10.7 kg. 3rd place. Jose C. Ojeda, on Mirage: 10.3 kg. 4th place. Mario Puebla, on El Fantasma: 9.3 kg. 5th place. Arvidson Joshoa, on Chasen Tail: 7.6 kg. 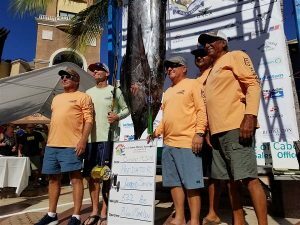 June 2 – 4, 2017: The Rescate Yacht Club Tournament saw 178 releases, mostly of sailfish. The top boat, Reel Mistress, had 25 releases, with Kryptonite and El Patron just two behind. The seas were nice and a good time was had by all. Thursday I was out on Patron and we were in a billfish and dorado frenzy. We caught a few 10 – 13 pounders and a lot of small ones, then it seemed like maybe they were full the other days. The biggest in the tournament was 14 pounds, with a couple slightly larger caught out in the center. Many small ones are being caught in close. They sure are some of the tastiest fish I’ve had! A few small tuna were seen, but I heard of only one caught. The one pulled in by Buena Vida today was not small! I haven’t confirmed the report, but the estimate was of 175 pounds. You never know! I was asking for a second gaff on Saturday, but our long battle turned out to be just a shark. There’s lots of life out there. I have never seen so much bait in my life anywhere. There were hordes of Bottlenose Dolphin out Thursday putting on some truly amazing aerial displays. We saw a few whales, mantas, turtles, and a school of Spinner Dolphin. Amazing numbers of Thresher Sharks. It’s unusual to see one jump even three times, but I saw one jump 13 times! They get big air! The yellowtail were still biting up the coast. The air is still nice and the water feels great. All very nice… but I’ll be out looking for a big tuna tomorrow! May 26 – 28, 2017: The Ladies International Fishing Tournament was Memorial Weekend with 18 boats and 35 anglers. I wish I could say that there were that many fish. There were 5 billfish released. Vi West with Captain Mike on Catch-a-Lotta took first with the first release. 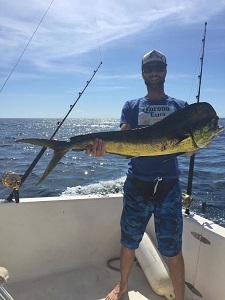 A 7.4 pound dorado was the largest weighed. That’s pretty sad, so I will officially blame it on the new moon. It’s a late start to the fishing season! There were still some yellowtail caught at times deep at the Island and far up the coast. Yes, the water is warm enough, but the wind and currents have been north and western directions. Seems like maybe the bait moved, or all the dolphin ate it up? Who knows! Reports from the south are quickly improving though of large dorado, tuna, wahoo, and lots of marlin. I think the sailfish mass comes up the center, so no report for that. Be patient! A lot of small dorado are out there. The numbers of billfish seen more to point to the bite just not being on, or for them being on the surface. Tuna were caught out in the center, but hush, hush. Not a lot of life out there, but this is the week. It’s going to happen for the Rescate Tournament! May 2017: Small dorado with big ones are on their way. Barracuda, skipjack, cabrilla, snapper in the bottomfishing catches, along with mostly small calicos. Earlier in May, a few yellowtail most times at the Island. Most have been on the jig, with a few on the poppers. One very large Almaco Jack was taken on a popper. 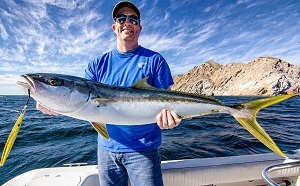 By the end of May, the yellowtail fishing seemed to be done, but a decent bite was found up the coast. We caught a few nice ones in close trolling around the outside Seamounts. 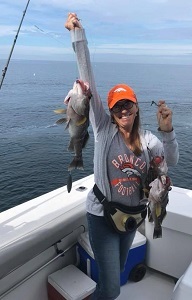 The middle Mounts were loaded with small 3-6 pound yellowtail. We did catch one baby sierra. A few small skipjack are in the mix. We hit the Pando up the coast. We caught three jigging and one smaller one on a small jig. I tossed the popper and caught two out of four hookups. Billfish were seen a few miles out. A few marlin were caught. There are some big turtles, mantas, Hammerheads, and massive pods of dolphin out there. 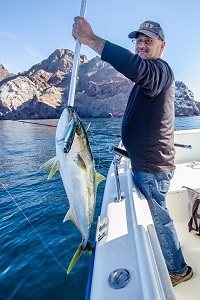 We found a good run of 12 – 16 pound yellowtail in close. One 10 pound cabrilla came up for our lure, and a handful of grouper are swimming around with some lures. There were tons of bait on the Seamounts. The bottomfishing picked up for the calico Golden Spotted Sea Bass. We caught a lot of half-respectable fish, and then all of a sudden on Saturday we caught big 4 – 6 pound fish. We caught a mix of whitefish Salmon and small snappers. Started to see the marlin. Yellowtail at San Pedro, and Tortuga was producing. The water is up to 74 degrees and clear not too far away. Dolphin, a big Fin Whale, humpback, Orcas. The bite turned on and good numbers were caught at San Antonio. They got into some good boils of biting fish at the Island. There is still a lot of bait in the water. We did wrestle this nice grouper out of the rocks today just outside the entrance. 24 pounds on a ballyhoo at the entrance, 47 pound Gulf Leopard Grouper. 30′ green mackerel on wire . Bottomfishing picked up. A few marlin were spotted, and the water cleared up with currents of sargasso, ballyhoo, and flying fish. It was showing 74 on the satellite chart. First cabrilla of the season. Yellowtail. 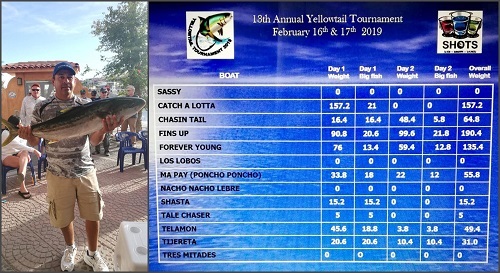 Last weekend was the 11th Annual Yellowtail Tournament. We had 14 boats and 49 anglers. Catch-a-Lotta (pictured on right) took Day One with ten of their largest fish weighing 158 pounds, and the biggest of the day at 19.77 pounds. Day Two saw Zancudo weigh in at 132 pounds to take third being Telamon. Catch-a-Lotta held on to win with 220 pounds. Play Time weighed in the big fish of the tournament at 22.86 pounds. Day One saw rough conditions, but Day Two saw most every boat at San Pedro for some decent catching. A few have been caught on the jig, but nothing on the troll. The bottomfishing seems to be slowly improving. There were a few getting caught jigging off San Antonio not too deep. It sounded like they may have had a preference for green jigs. There were some good midday catches up at White Rock last week. A few were getting caught at the Island. We did get to cruise with a few Humpback Whales up the coast. 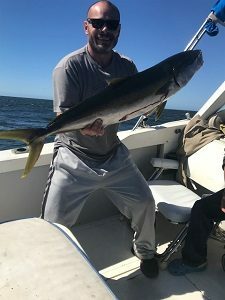 A friend picked up a 25 pound yellowtail in close today. We have caught a few good sized yellowtail in close. Some Sierra. The Island was producing, as well as far up the coast at times, and Haystack the same. The water continues to cool. The Sierra and Bonita may be all gone. The bite turned on Wednesday and finally moved offshore. We caught ten big ones in the rain the next day. They were biting trolled Rapalas, with a few taking jigs and poppers. Then it seemed like the rain caused an algae bloom, or the water to turn over, and it was a little brown Christmas Day. The water has since cleared up and a few were caught again in close. It was off and on up the coast and off Haystack. The Island has produced some good catches in the afternoon. There’s never a guarantee, but I think we’ll see some improved action this week. We are coming off the full moon slump and the bite is picking up. It still seems to be a quick morning bite. There were big ones right at the Point today. It seems like they are shallow most of the time, and I have yet to find a deep bite on the jig. The pangas are getting them on live bait off the points when the current is pulling. Some good bites have been found at Haystack and White Rock at times. They are biting the big Rapalas better. There are a few cabrilla and sierra in close. The marlin are gone for the year. Most every morning has been fishable. Expect some fish this week if you are on the water! We had a lot of nice mornings on the water this week with some big fish caught. I have never seen such activity, but often they wouldn’t touch anything. 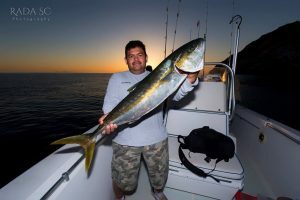 The yellowtail are big in close, with some fish off Haystack and some huge schools right out front. They were chasing hordes of bait to 6″, but they don’t want to chase individual baits. The pangueros did decent at times with live bait, and we caught some on green 30′ Rapalas. Some were fooled by medium sized poppers and one smaller green and white jig. I tried dozens of lures. Hopefully they will bite better after the full moon. There are still some bonita, sierra, snapper, and cabrilla in close. There were some marlin out there and the pangas caught a few. I also saw some large corvina netted in close. They are probably feeding under the moon, so it could be a tough week. We are progressing into yellowtail season. There are still a few Sierra around and the bonita can be good early on with smaller lures. It is warming a bit and we expect some lighter winds over the next week. Not sure if a few marlin might swim by, but the water in close is hovering around 66 degrees. 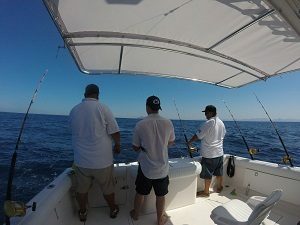 We went 25 out to the south looking for tuna, dorado, and marlin. There were lots of spotted and common dolphin, birds flying, and deep bait readings all over. Maybe the tuna were deep. On Monday, we didn’t wait long enough. 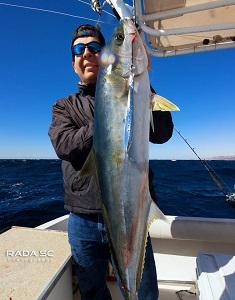 The yellowtail came up around 2:00pm down by Guaymas for a hot popper bite. There were a few fair reports from the Island. There were some great boils all over in close at times, but they are tough with all the bait around. There are some big ones though! We caught one around 25 pounds just outside the entrance. We also lost a huge cabrilla near the boat. Timing is everything, and there are some exciting looking tide changes coming up with the full moon. I’d expect some epic catches if you are on the water, … and not at home during the ‘bite’. The winds are still blowing, but we’re getting our fishing in. The bonita bite tapered off. The water is very dirty inside and the bait has moved offshore. A few Sierra were caught, but they seem to be out of here. We caught a few nice snapper and five big cabrilla in close. We’ve been picking up a few large yellowtail outside the Seamounts, but they have been tough. We were surprised on one sunset cruise to catch two monsters just yards from Doble. There have been some massive boils. 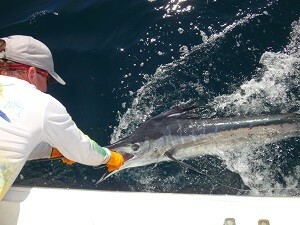 The marlin have come up at times, and we and another boat both released one. They are still there on the bait balls, but can’t see more than ten feet. I heard of one good yellowtail catch from the Island and one from the Pando. The warm water has come closer, but I haven’t heard of anyone going 24 miles out. I think we’re hunkering down near shore for a few days as some cool air blows through. The winds are blowing, but that’s not keeping us from catching fish. The wind was up daily, keeping the warm water from coming in. The water cleared up a bit, but the wind isn’t helping. Still, we are able to fish in close and the mornings are calm. The bonita are showing in very good numbers and we are picking up a dozen an hour. The 15′ purple Rapala seems to be their favorite. Hot spots have moved around from around Deer Island, off the Tetakawi, and even from the entrance to Doble. We’ve had the best luck scraping the rocks in close. They were hitting jigs on the light spinning rods yesterday. We caught a few yellowtailed snappers throughout the week. There are a few small yellowtail out there. 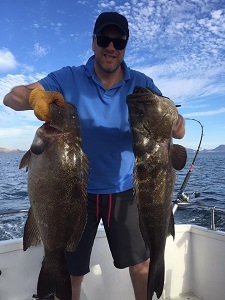 We have seen a handful of boils from Doble and mainly around the Seamounts, where we picked up one 22 pound fish. We thought it was a marlin and turned on it just before the line almost ran out. Some Sierra are still around somewhere. 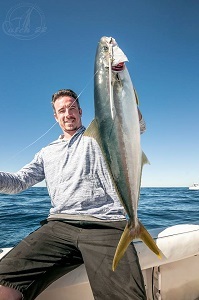 There was a hot yellowtail bite up the coast the week before on big fish, but last week had slim pickings up there. 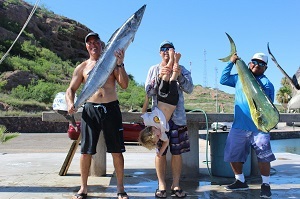 I heard of one decent dorado lost in close yesterday, but they are probably all 50 miles out now. I haven’t heard of anyone trying offshore or at the Island. A number of marlin are right off of Doble at the moment, but they are tough. They are very focused on the bait balls. I watched one try to catch a shrimp for a full minute. They could start biting though. I saw one in 40 feet of water, 40 yards off the inside of Deer Island. The bait schools in the bays are thinning out, but look for the birds, dark shadows, and any ripples. We caught several hundred green mackerel from shore last week. I caught a nice variety of fish on small jigs. Try slowing your retrieve down at times to catch hard fighting 10-12″ bonefish. The North end of Honeymoon still shows consistent activity. It’s going to be a busy week of catching, and look for us hooked up to some marlin late mornings off Doble … I hope. Conditions are showing an imminent change. Still, with as much trepidation as a Trump victory, I am calling for a marlin resurgence this week. Some dorado were caught up the coast today, and a few seen this week. I didn’t hear of anyone fishing the blue water in the center. There tentatively seems to be some warmer, clearer water creeping up the coast on the ‘supermoon’. There is a ton of bait in close, pleasing to all species. The bonita and Sierra catch has been decent. There are also some snapper and cabrilla showing up. We caught one 13 pound Leopard Grouper today in close. The fish may be full at times, but I’d still expect some decent catches this week. Well, not the most important report for the moment, but here is the Fishing Report! I think the state of the fisheries was not even a thought in this election. 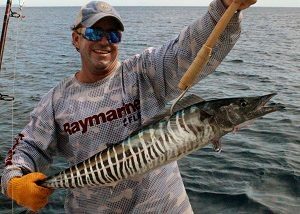 We made it out past the Reef with no luck, but found another small wahoo at the Island. I heard of one report of nothing farther out, but we need a search party to eliminate the possibility of tuna and dorado out there. The water is still blue and warm in the center. In close, the water turned over. I don’t think the fish are gone — they just can’t see and are deep, along with the bait. I saw some dorado at Doble the other day. We caught a number of bonita in close deep the day before. Some large Sierra are showing. 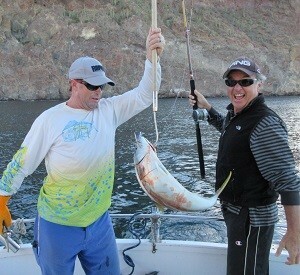 Fisher and I did make it out yesterday in the coolest 75 degree water that I have seen for a 13 pound yellowtail. We caught a sail a few miles out earlier in the week. We missed one marlin at the Island, but they were pretty absent after we caught two in close on Wednesday. The inshore action is great at times. There were a ton of tuna caught to the far far south. Come on Supermoon for our last taste of summer! It looks like it might finally start to cool down. This is the warmest October I’ve ever experienced here in San Carlos. A few sailfish were caught last week, but I don’t know if we’ll see many more. 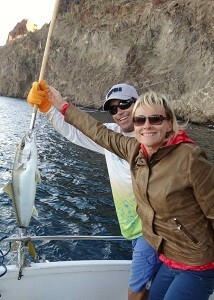 We are still getting a few dorado, mainly in tight to the rocks. We even caught one weighing 11 pounds at the marina entrance. Four good tuna were caught last week a few miles from the Island! A few boats fished offshore for a couple of billfish, one at 300 pounds, and some yellowtail at San Marcos. 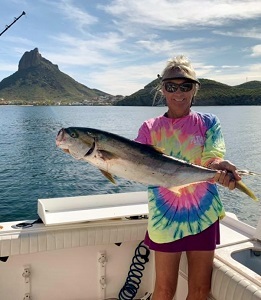 Yellowtail are being caught deep jigging at the Island. We got surprised by two 11-pound wahoo there today. 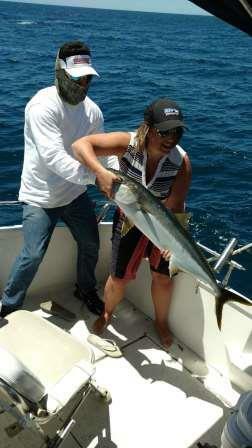 There were good bonita around and we caught plenty all week in close, along with the skipjack. A number of marlin were found in close, but the bite was a little finicky. We had one 200 pound Blue open a hook today. The bay, beaches, and shorelines are full of bait, with plenty of hungry predators around. No complaints here! Summer doesn’t want to end! Even with the wind today, the sun still felt hot. When it’s not blowing, which has been a lot, it has been very warm. We had thunderstorms pop up, and even have a category 4 hurricane far to the south. The water has been 80 – 83.5F, and even showed 90F in the middle on Monday. The fish though I think are expecting a change. A few bonita are coming up, along with Sierra in close. My friend’s jigged up a few yellowtail at the Island, and another boat caught them on the other side. One big change is all the billfish and dorado showing in close. A few boats released up to five marlin over the weekend. My friend’s caught a small Blue 400 yards out, and we caught a 200 pound Black in the middle of the Bay. 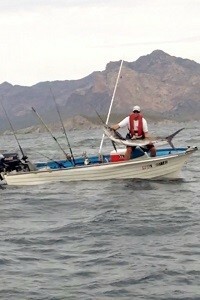 Today we caught a marlin about 80 yards off Deer Island, and a 14 pound dorado twenty yards off Doble. I missed one big sail right outside the Seamounts. We’ve seen packs of marlin on small bait, and most within a mile. It looks great 22 miles out, but we’re saving fuel where we know the fish are. There has been some great inshore activity. There are some larger Roosterfish around and a number of big jacks. As long as there is good bait, water temp isn’t as important, and it is nice and blue right up to shore at times. There’s still plenty of time for winter to arrive, and I’m warm blooded anyhow. We are into October, but it doesn’t feel like it! We’ve had some light afternoon NW breezes kicking up some small chop some days, but the sun still feels intense if you are not in the breeze. The mornings are all glass calm, leading to some midday sweating. We’ve had great boat rides though, with some mild sea life around. See below for the winners of the Hammer Down tournament. Some boats got skunked! I don’t like to report it, but we’ve had a few of those days lately. It has been tough. There is a fair amount of small dorado around if you troll some small lures. They are little bait robbers, but small light tackle catches them. Nothing made weight in the tournament, but I saw one dorado that was 0.5 pounds shy. 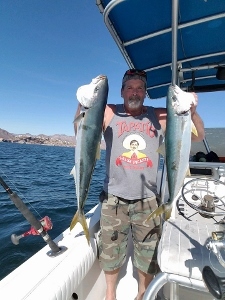 A couple of 20 pound fish were caught in close, and dorado were even seen from shore. I think I had a Blue biting a mile out today, one was caught at 5 miles, and we missed one at 7 miles. There were a number of small Blue Marlin released in the tournament, and tales of some large ones lost. A few sails were showing up, and there were reports of some in real close. I don’t know if the monster swarm of them that swam through in June will be seen this year again. I think the best numbers of Striped Marlin are still deep and a month away from showing their force. 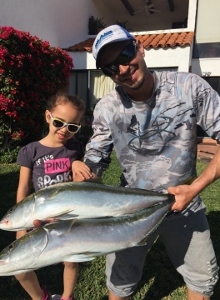 Inshore action is there, with Sierra, some corvina, and even a monster Snook caught. Well, back to the tournament. Three boats had two releases on Day One. 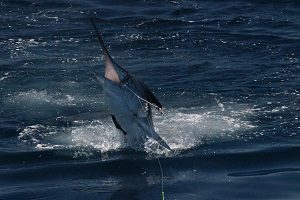 Kryptonite held strong with another early release, a good marlin release, and a sail on the final day – but their pictures didn’t turn out! Heartbreak!!! We’ve gotten complacent only running one camera. I’ve certainly been there myself losing dozens of photos, and have lost that Tournament Invitation a couple of times on shady calls. So, .. 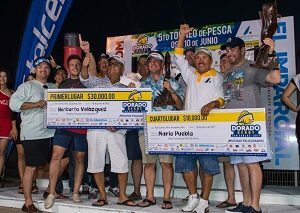 I guess we on Telamon have to come up with the money to fish the World Offshore Invitational Tournament in Costa Rica. I’ve been there twice and we have a good team. We just have to be great to win! We paid for our fishing with the win from our three releases. The charities generated some good money and many walked away with great prizes. 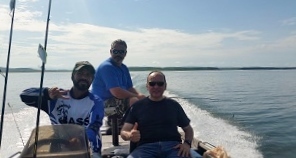 All had fun hopefully – (even with the slow fishing! ), except Kryptonite (who still took second) who has a sad story to tell, that I can sympathize with. Well, that’s tournament fishing. So,… we’ll be out there daily this week, and most of next, waiting for it to cool down, and working on catching fish to give you the next report! Hammer Down Fishing Tournament Results: Click for the Results and photos from the Hammer Down Fishing Tournament that was held October 7 – 9, 2016. This weekend is the Hammer Down Tournament, a combination of the Labor Day and Cantina Cup. Many thought it was just too hot most Labor Days and the organizers of the Cantina Cup lost interest, so now we have one final tournament. Hopefully we’ll see about 20 boats, and even some fish weighed! We’ve had a few half-day charters. We keep missing a marlin in close that wants our lures, but not always the bait. There has been a lot of small dorado out there, but few that even make 5 pounds. Some friends found a few weighing up to 20 pounds far out on Saturday. We’ll see what can be found in the tournament. The season seems to be changing. Cool green 80 degree water is about to the Island and some yellowtail are being caught. The action inshore cooled off a bit, but should slowly pick up again. Cool dry northwest winds are starting up. I mourn watching the blue water leave, but in the process the best fishing can take place. It might happen quickly, or slowly, so get down and get on the water. We finally got back after seven weeks of vacation to Tahoe, Heber Valley, Marble Canyon, Lake Powell, Utah again, Silverthorne, Carbondale, and Durango. It was an adventure camping with the dogs and a toddler. Here is San Carlos, boats are starting to get on the water again. It is a lot cooler than in past years! Water temps are already in the mid-80’s with comfortable air temps and light winds. We released one sail on Saturday, bent a hook on another, caught one decent dorado, and caught and released many small ones. There is a ton of large debris and bait out there. There were reports of a few billfish and some good dorado. They are catching tuna and wahoo off the East Cape and I am hopeful that we will see a few. I caught a lot of fish from shore the last couple of mornings. I think we are going to have a great couple of months coming up! There’s not much to talk about, but it’s better than nothing. We got out late the other day to release a couple of sails outside the Reef. We had a mob of tuna come in … but they were Skipjack. I haven’t heard of any bite, besides small snapper at times. We are seeing a few turtles and dolphin. We did see a few small pods of white Risso’s Dolphins the other day. One surprise catch was that of a 22 pound Roosterfish down by Miramar. Supposedly there were some billfish in close last week, but all we found over two mornings was one dorado. It’s still nice to get on the water though with some cooler mornings. There’s reports that even far out, there’s nothing biting. Better to take a few days and fish the other side! Too far for me. I’m headed to the mountains. 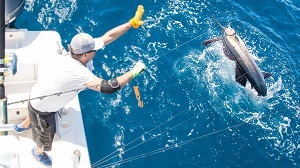 The 69th International Billfish Tournament saw 9 boats releasing 24 billfish. No dorado were weighed. Kryptonite took the tournament, but Eleanor on Predator won top angler with six releases for the first woman ever to be top angler! I’m hoping it’s the new moon, but fishing has been tough. The best bite was out in the center over the weekend, though I heard of legendary action on the other side. We caught a lot of good Sierra in close today, along with finding a few sailfish inside the Reef. We found but a few tuna yesterday off a 180, where some were caught on Sunday. Nothing big though. Last Wednesday they found a number of small tuna just 6 miles out, but as usual, if you are going off yesterday’s report … you may be too late. They were gone the next day. International Billfish Tournament Results: Click for the Results and photos from the International Billfish Tournament that was held July 1 – 3, 2016. The fish are out there somewhere! It’s been rough the last couple of days with no one going out. Last week a few big dorado were lost in close. My friend found good ones 50 miles out, and some buried in sargasso against the other side. The billfish are few and far between. A pile of small tuna and some dorado were found on Friday about 24 miles out, moving to 35+ by Sunday. The full moon and tides are coming up, so we’ll keep our fingers crossed for this week! Well, if you didn’t hear of any fish caught this week, it may have been because people weren’t talking. 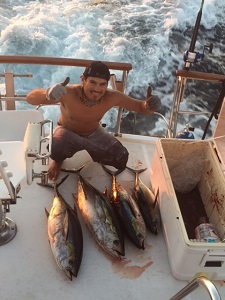 Small tuna to 12 pounds were caught from 150-210, 15-23 miles out. The tuna boats are far to the south fishing the big ones, though I am sure they are reading this report on whatsupsancarlos.com. It was rough last week! We were out in the middle alone on Friday with some 5 – 6 feet swells rolling through at times. It made the other days seem calm! 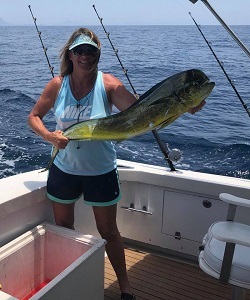 Thursday saw a lot of dorado coming through from 6 – 12 pounds in small schools, and the sailfish were also consistently biting. A few marlin are coming around again, and I wouldn’t be surprised if some big ones don’t show up with all the ‘bait’ out there. The tuna are biting short on feathers and cedar plugs. At times you need to weed through a lot of skipjack and bonito. The yellowfin sure seem to like the poppers. We are enjoying the sashimi. Hope to see you at the weigh station for the IBT this weekend! We are still getting a lot of nice days on the water. The green water is pushing out at times, but it was blue into the shoreline at times. There have been a lot of turtles coming in, with a few of their favorite jell fish to eat. The water is up to 85 and clear blue. Bring a lot of cool drinks, think about trolling with some angle to the breeze, and when all else fails … get wet. You may have heard of the report of 41 sailfish caught and released in one day! Well, they hit the core of that massive school of sailfish and worked them hard. That was starting at 32 miles on Saturday. Unfortunately, those fish were moving west with the bait. They were at 17 miles last Tuesday, farther east. Let’s hope they circulate back this direction after the full moon, because the pickings in close are minimal. The tuna were up sporadically into Friday before they pretty much disappeared. There were also decent catches of larger dorado that seemed to have fled too. There were a large marlin or two caught closer to Tortuga, along with the only good marlin reports. A few big wahoo, and a number lost, were caught close to Tortuga. In close, there are but some Skipjack, Sierra, and small Dorado. Moral of the story — if you’re reading this you are too late, you should have been here by now, and you better have a fast boat that can get you to the other side. The sargasso is long gone – thanks El Nino. There is little debris or marine life. There are some flying fish around … with no dorado. I’m not giving up hope, but we are not holding our breath. We will still be out fishing almost daily, catching a sailfish or two and hopefully picking up dinner. Life could be much worse. A few respectable dorado are showing up. The sailfish are just beginning to filter around even with an incessant moderate NW breeze. They are thick off the Horseshoe. The marlin are packed together in areas at the right times. Bites have been all over and changing daily. The blue water and fish have been in very close at times. The pangas were getting snapper in the Bay, with some bonita and sierra around. There are lots of varied life out there in places. The sargasso and small dorado can be a nuisance at times. Both our boats picked up three marlin releases each today, with some better dorado chasIng flying fish below frigates in close. The ladies saw some good action over the weekend! It was a great turnout. Congrats Judy on Kryptonite with eight releases for the win! We unfortunately followed hot reports, and in actuality the best bites were right where I would have gone. We’re out daily, so give us a call – Team Margarita on ch. 68. The water is 78 and the air won’t get cooler! Tournament time is coming up! This weekend the ladies will get to play, with the Rescate the weekend after. The full moon seemed to challenge the bite, and we’ll see if we can figure the fish out again. They always keep you guessing. Some schools of small dorado were found on larger sargasso patches last week. I only heard of one decent fish caught weighing 25 pounds. There are still no reports of wahoo or tuna. The skipjack are starting to show up. We caught a number of bonita and sierra in close. There were also a number of billfish in close. My friend saw one inside the point and caught one 300 yards out. I saw a few and missed one 1/4 miles out and caught a sail and marlin 1-2 miles out. There is a lot of bait around and the bigger ones will be right behind. The weather has been fairly favorable. Temps are 76-78 in the blue, with some cooler green water in areas. The Fin Whales have been around and occasionally the Orcas. I never saw so many mantas as on Saturday, and the Mobula Rays are moving back in. Things are looking good for the Memorial Day weekend, and even better if the fish are biting! The water is heating up and so is the fishing. The sailfish didn’t seem to move in in great numbers, but some big ones are spread around. The marlin did show in mass on the backside of the Island and then down the Reef. We had more come up in our spread on Saturday afternoon than I’ve ever seen. We were sweating and waiting for the next fish to take another swim. You could dive down six feet and feel the water cool off 4-5 degrees. The next day Terrafin showed 85 on the surface at the end of the Reef! Don’t worry though, the ocean didn’t actually warm up ten degrees in a week. Some small dorado are swimming around in schools, but not a lot, and not very many big ones. Some bottomfish were caught, but very deep. I think it’s safe to put away the yellowtail gear. Sleep in with the full moon and find that blue water right out front. There is plenty of Sea life out there (we spotted a couple of turtles). The weather looks good, so get out there before it gets even hotter! This should be the week that we see significant warming. Some cool water popped up with the tide and winds, turning the water green in close. Outside, the water is blue and into the mid-70’s to close to 80 in the afternoon. We were out in the blue today seeing lots of sailfish coming in. 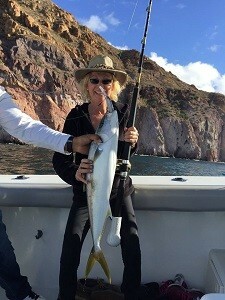 We caught one good 13 pound dorado and saw others. There was a good amount of all the bait – anchovies, ballyhoo, flying fish, crabs, and squid. The billfish were coming in hot on the teasers and switching off to the baits. We’ve released a couple dozen now in the last few weeks. The Island saw a few yellowtail caught today. We picked up one bonita at San Antonio yesterday afternoon and saw some Fin Whales. The Orcas have been seen a number of times lately. There are also lots of dolphin, mantas, and sharks out there. The weather is great with light breezes. It’s a great time to get out on the water! Just got back, thanks to a marlin biting ten minutes before sunset. Not bad for a two hour cruise! 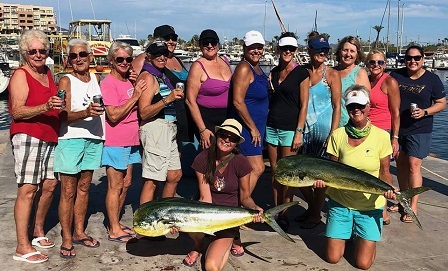 On Sunday we picked up another release on a half day, and Saturday three marlin releases in six hours and our first dorado and bonita of the year. My friends got out early that day and released seven marlin, a sail, and a number of small dorado. I have not heard of any big dorado caught. A few yellowtail were caught, but the season is winding down. Sierra, bonita, and cabrilla are biting in close. The water is 73-74 degrees right now, but the Northwest winds are supposed to abate a bit more this week. The Orcas were sighted a few times this last week! It was feeling like summer last week! The marlin flooded in on south winds followed by dorado and sailfish. No word of any tuna yet. We caught our first sailfish yesterday, along with three marlin on an afternoon outing. There were six glass calm afternoons in a row. Terrafin showed 83 one day, and we read 78 on Wednesday. Mostly, temps are 73 – 75. 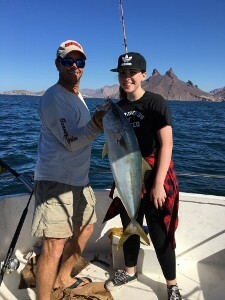 A few dorado to 20 pounds were caught, along with a few yellowtail. We found some 6 – 9 pound Sierra around the Bay. The marlin are all over around the Reef and inside. There is a lot of bait out there. There’s lots of various life to be seen and the air temperature is perfect! This week looks warm, but the winds still don’t want to seem to turn around. I saw a global image last week though that showed a good hint of things turning around. It is warm and the clear water is not too far out there. We did see one marlin jumping at the Island. The bite was good in the late, late afternoons at the Island. We only caught two yesterday there and didn’t see any surface activity, but my friends found one hot lure and location there the day before. The right tide can help. I’m not sure how many may be spawning on this full moon. It could make things tough this week. We’ll see if the full moon turns on the spawn and bite for any of the bass species. The calico fishing was fair this last week. I didn’t hear of any Grouper catches. We got lucky with one big yellowtail in the Bay, so there are some around between here and San Antonio. The crew from Grey Goose, the winners of the 2015 Labor Day Tournament, are representing San Carlos in the 2016 World Offshore Championship. They released 22 sails yesterday — good for 22nd place of 66 teams. Pretty good for the tough field of competitors gathered in Costa Rica! It’s been much of the same with the fishing in San Carlos. 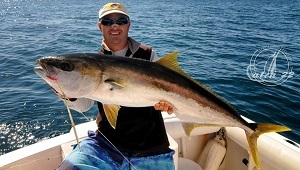 There are small to medium-sized yellowtail up the coast with larger ones at the Island. The bite at the White Rocks is better in the morning and the Island is better in the afternoon. Jigging sounds more productive in the morning. Poppers are working on boiling fish and at the Island on the right tide. Later in the week looks good for the afternoon. I haven’t seen a boil in close in weeks. We managed one yellowtail bottomfishing. 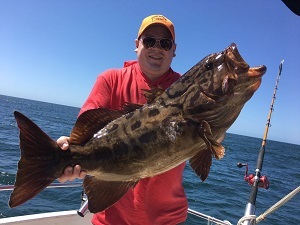 The bite has been better for the Golden Spotted Sea Bass. There are some cabrilla in close and at the Island, and it sounded like the bite is on at Isla Tortuga. Water temps are getting above 72. We passed a nice feeding marlin the other day just a couple miles out. Summer is getting closer! It was another tough week of fishing in close after the full moon. At times there was a plague of seaweed making trolling impossible. The winds were often up, inciting involuntary singing by ‘mariachis’. Combine that with seemingly very few fish around. 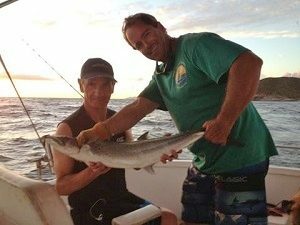 We usually managed to scrape together a meal with some bottomfish, a few sierra, one 18 pound yellowtail by Haystack, and a few good cabrilla. The dolphin have been around, as well as a few turtles, and lots of jumping Mobula Rays. A few marlin are being seen, but none caught. With a better weather report and waning moon, I expect this week to be better. We did make it up the coast to find a slow bite at the first white rock. We then headed to the Island which had an improved report. It got rough, but we were able to chase the birds on the west side for some nice yellowtail on poppers. I expect the Island will finally turn on this month, weather permitting. The week started out decent before the full moon, but after felt like the Semana Santa crowd. It has been too rough to jig the last few days, but a few boats scraped out a meal working hard at it. The bottom fishing was decent, and then got tough. We saw one marlin, but that was it. We have caught a few good cabrilla and snapper in close, but lately very little. We got lucky with one big yellowtail the other day right before Haystack. A few Sierra are out there. Most days we have been able to scrape up a meal, but not all of them. A few catches are coming in from up at Punta San Pedro, and the Orcas were seen there the other day. Water temps are 70-73 degrees with fairly clear water, though plagued with seaweed at times. A few other whales are out there, as are dolphin and seals, and a lot of Mobula Rays, which all combined help to provide entertainment on the water. Now if the wind would just let up! Things are heating up for the week. There are lots of boats cruising around chasing whales and dolphins. Many were Bottomfishing this morning. We joined them and got some nice calicos. I started marking more bait throughout the day with a hot evening bite along the rocks. I think all species may be having a spawn on the full moon here, including the two-legged variety. We were up the coast yesterday afternoon and the fish didn’t come up for us. 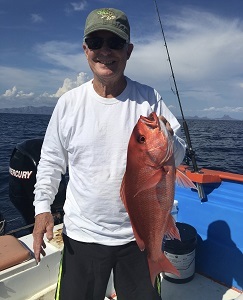 The afternoon bite was hot at the Island while I was gone for yellowtail, snappers, and several varieties of cabrilla – one I’d never seen and a number of Golden Cabrilla. We did get a lot of sierra mackerels and barracuda. Then today they did show there again, and at the Island. 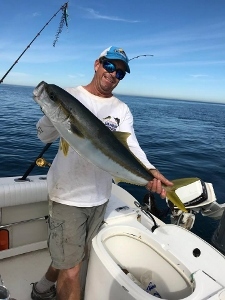 The bite is tough, but some yellowtail are being caught. We did pretty good in close this afternoon for cabrilla and pargo. They sure taste good and they are not far away. A good number of marlin came through, but we have only seen one in close. A pack was seen at the Island and I bet that they are stacked up on the Reef. I read 75 degree water today, and Terrafin showed 79 out there on Monday. The wind will come up briefly, but then in looks to warm up next week again. 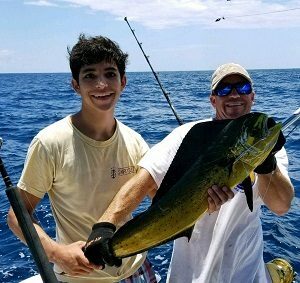 One sailor saw dorado under a weed patch 25 miles out. Now who’s going to find the tuna! The fishing has been mostly slow, but is great at times. There have been a few late afternoons when there were good boils and surface action off San Antonio. It also looks like they had one good morning for surface action at the Island. Up the coast has been pretty slow. There has been a lot of seaweed out there making trolling difficult. Many boils were up only briefly, with jigging fairly slow. A few marlin were coming through. Pangas were getting short bites on live bait. A few Sierra and cabrilla are being caught. The weather has been pretty nice at least. The moon, tides, and spawn phase all look good for the next few days, but I think I’ve given up on predicting a great bite. You need to put in the time to get lucky! The marlin came back this week! We released five in two days. It really looked nice off the Reef, showing blue and 76 on Terrafin. We saw some turtles and flying fish. 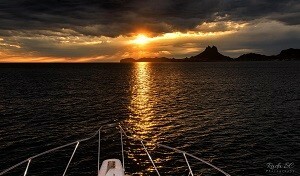 The tuna and dorado could be out there! The yellowtail fishing has picked up. There was still some good action up the coast and some at the Island, but also some good action in close at times. We hit our limit on Monday with big surface boils all around. They were nice 10 – 15 pound fish. The wind is back at the moment, but the forecast looks good. We saw some Mobula Rays out today. The whales were around most of the week. Things are looking good! We are getting some nice weather! That can always make a slow day of fishing better, which plenty are still experiencing. The whales weren’t seen in number, though a few Orcas came through. The bottom fishing is picking up. I am still hopeful that things will be picking up as the bait gets bigger and the fish go on the feed before the spawn. The water is warming quickly. The marlin are already moving in and up the coast. We’ve seen flying fish, and we might even see dorado and tuna soon. On that note though, I’m not sure if the schools of yellowtail up the coast might just chase the cooler water to the north. I’ve seen those spring tides kick up cold water out of nowhere, so only time will tell. Last weekend saw the 10th Yellowtail Tournament here with 12 boats and 47 anglers. Shots Restaurant hosted the event and cooked up a spectacular meal. Day One saw very slow fishing after great reports the previous day. All the good reports had been coming from up the coast. That day though the fish came up at San Antonio where a few fish were caught. Many boats tried the Island where there was tons of bait and hopefully the big one for the jackpot. 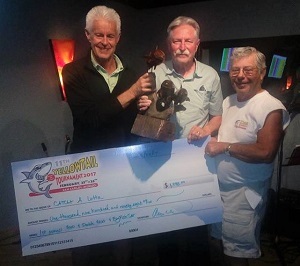 The Saturday jackpot though was won up the coast with a 14.1 pound fish. The total for the day was also taken late up the coast by Warpath. The bite was found up there again, with the best action 25 miles away at White Rock. The fish were chasing bait on the surface and several boats loaded up with limits of nice fish on poppers and jigs. 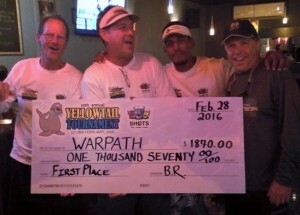 In the end, Warpath took the day again, and the tournament with 185 pounds for their 15 fish. 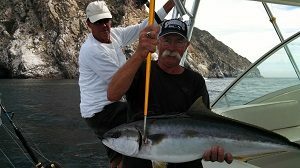 One other nice check though went to Rod Tuggers for their 19.1 pound yellowtail. I think everyone had fun in the nice weather. As the story has been for a couple of months now, if you want good fishing, you’re going to need to run up the coast and hopefully find them biting. We had some beautiful weather last week! It was glass calm for several days, which made for some great whale watching. Whale watching is something that is very difficult to guarantee, unless you spend entire days looking. For several days they were around. I think there were some Fin Whales around, but on Friday they were all Grey Whales. I have never seen this large a group in close, and especially full grown adults feeding. We had a monster come within 20 feet of the boat, and most everyone had close encounters. One juvenile put on quite a show! They were feeding on krill and small fry possibly, along with several thousand Greebs. … And the next day they were gone, much like the fishing. The bottom fishing is slowly picking up. We caught a few Sierra which is rare for February. There were even a few marlin seen! The yellowtail bit good at the Island one day, followed by two very poor reports. They bit good in close finally on Wednesday, briefly on Thursday morning and afternoon, slow all Friday, fairly good Saturday, and then nothing on Sunday. The Seamounts had a few large fish. The seals ate well at times in all locations! 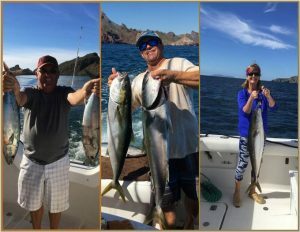 The bite up the coast was fairly consistent for some excellent catches of yellowtail and a few cabrilla. We’ll see where the hot bite is for the tournament this weekend. The whales were seen again on Monday, so we’ll see if they stick around! First off, I heard ‘San Antonio’ from my father last week, but the bite was really off ‘San Pedro Point’. You have to make the trek, and sometimes stick it out into the afternoon wind. It’s scenic at least, … and then you’ll miss the hot bite by a day. It’s been off and on. Reports in close have been mostly tales, if true. It’s pretty dismal 🙁 !!! A few Island reports are trickling in. The bait is miniscule at the moment, but growing. There are a number of whales around and the birds are busy up the coast. At least we are getting a break from the wind and it is warmer. Don’t give up hope yet! It sounds like the yellowtail have moved in! My father and friends were out today and caught a bunch off San Antonio. They were eating small sardines but hitting jigs and lures. I think the marlin are gone for some time as the water has significantly cooled off. The wind has been incessant in the afternoons. Earlier in the week, and last, the bite was up the coast around Ensenada and farther up. We went up one day, not finding morning action, but the bait was thick. It sounded like activity picked up better some afternoons. Boats said the whales were pushing bait with the yellowtail along with them. One whale shark was spotted, and we even saw one turtle. Looks like we’ll have some better weather this week. Hopefully the calico bass will start biting. There’s only a few weeks of practice left before the yellowtail tournament! Well, the wind is back. We had a few nice days and the water warmed up to 70. We got a couple of marlin after last week’s blow and a few were caught on Sunday. I thought we were going to have a chance on Monday for the first February marlin ever, but the front rolled in. I saw flying fish and larger needle fish last week and was beginning to think that maybe we were into the new season and not the lingering of last year’s fish. There were blankets (millions!) of anchovy fry in the water, and tons of readings farther down. Some of the marlin seemed to be in the areas we found them at the start of last year. The Island still sounds slow (from a few reports), but one friend did alright midday. The area off San Antonio held most of the marlin and some good yellowtail if you were persistent and could avoid Jaws the sea lion. The spot up the coast was hot again, and we hit it a day late with all the other boats for only a few fish. It seemed like the full moon slump again, and we’ll keep our fingers crossed for tomorrow. The cold is back, but maybe we can mark this as the end of the 2015 marlin run and start the 2016 yellowtail run. The people want meat! The warm water plume pushed up the coast on the full moon, bringing in a lot of marlin. We released nine in the last three mornings! They were spotted up the coast, so some may be around for a few days. The wind is back after a couple nice days. The best bet for yellowtail is still far up the coast. There are some in close, but tough to catch. There is still a mixed bag of fish out there. The jigging is decent off San Antonio. I didn’t hear of anyone going offshore. I believe I heard of one poor report from the Island. The bottom fishing sounds fair. Maybe the bite will turn on after the full moon? A few Humpbacks are coming through. The Orcas were spotted out there one day. I saw my first flying fish in months, but I can’t say yet that winter is over. Not a lot of boats are heading out these days. Mornings are fishable, but there’s not much being caught. There have been some good reports from up the coast for cabrilla, yellowtail, and Sierra. I saw good readings in close, but they just weren’t biting. Maybe we can blame it on the new moon. I saw a jumper and a panga catch a marlin on the Seamounts on Saturday. One was supposedly caught on a jig. The last time I was out on Sunday, one was seen off La Manga. Hopefully the fish will slide down the coast, as the best report I heard was from far up the coast. It sounds like there is a decent bite on the bottom out there, weather permitting. The wind just doesn’t want to let up this year! The marlin, it seems, have finally left. I heard of a few boats going offshore, but I didn’t hear of any tuna catches. The water has dropped to 68-69 degrees and is clear. We saw a couple of marlin on Sunday. Some have been seen in extremely close. The last one we caught was on December 31st. That’s definitely our latest date in the year for ever catching a billfish! The fishing has been off and on, with few good stretches. It turned on Sunday with fish boiling all over in close. They were nice fish, with some hitting the surface poppers. Jigging has been good at times, but also only good in a spot for a day or two. Some great cabrilla catches were found up the coast, along with some Sierra. Bonita were caught at the Island, with a lot of larger yellowtail fed to the seals. Some boats are bottom fishing, but I haven’t heard of any reports. 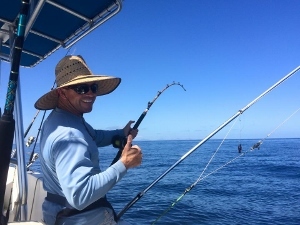 There are fairly favorable forecasts for the week, and the bite should pick up as we come off the full moon with very favorable tides, lots of bait, and cooler waters. It was a fishy week. I made it to the lake with my father and father-in-law. We caught about 80 bass with around 8 from 3-4 pounds. The big ones will be out on the next full moon. On Christmas Day we were out again for three quick marlin releases for the dads and myself, all within a couple miles and in under two hours. A group had headed offshore that morning and Dakota had already boated a 100 pound tuna by 9:00am! We knew what we had to do though after last year’s reprimand for coming home late. A few large ones were caught that day and a number of 15-20 pound fish. Some big yellowtail were caught on the jig deep during the week. We found some big ones at times in close on the troll. We tried again for the tuna by ourselves, and struck out again. On Monday, they slayed them on the jig early and we saw crazy numbers boiling just the other side of the moorings. Today, the yellowtail would not bite. The water is finally dipping below 70 degrees, but the marlin are still biting at times. We’ll see who gets the next tuna. The boats are busy, so hopefully the weather cooperates! There was a little lull in the bite the last couple of days, but I think they will be back on before Christmas. There will be quite a blow after Christmas, but hopefully it will be fishable in the mornings. The water has finally cooled back down a bit, and we’ll see if we get one more El Niño full moon blast of warm water from the Southeast, or if the El Norte winter wind takes over. It was still a pretty good week for marlin in close. The yellowtail bite was good a times and there are still some sierra around. There were some reports of tuna from the very few boats venturing out. The last report was from only eight miles out! The previous was of lots of tuna at 32, but tough to catch. They also released five marlin that afternoon. 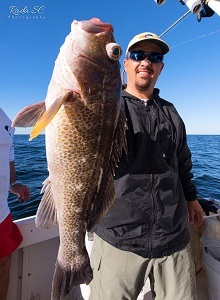 Jigging worked for yellowtail offshore, live bait, and trolling around the Seamounts. Look for great fishing this week, but expect some wind this weekend! The billfish season continues in San Carlos. We released over a dozen marlin last week. It almost seems like a repeat of the previous month to me, with temperatures cooling back down to the low 70’s and the fish moving back to the same areas. The warm water is still trying to move up the coast. It was up to 75, with a 220 pound Blue Marlin and tuna weighing up to 55 pounds caught offshore. The sierra bite was very good at times for some fish weighing up to 10 pounds. We had some very nice days. The Island still sounds slow. We caught some very nice yellowtail today at the Seamounts, with marlin coming up too. We have seen marlin within a hundred yards of shore. I think we’ll see some good fishing through the holidays! Thursday saw four marlin releases on our boat in a few action-packed hours. Friday morning saw the yellowtail coming up all over just around Doble. We landed three nice fish and then went after marlin. In the end, we released seven marlin and a large sailfish. Last year I set a personal record by releasing my latest sail ever on November 15th. It was a fantastic day of fishing and the weather was perfect. We saw all the sealife last week, and I still think the Orcas will show any day now. One thing I am sure of is that there is a lot of yellowtail, sierra, and marlin to be caught this week. I also think the El Niño has one more push for this next full moon to keep the marlin around into the big holiday week, if winter ever really settles in this season. It is now December, but there are still marlin around. The good thing is that they are within a mile, especially since the wind is relentless. We almost had a double sailfish last Wednesday, and some were caught this week. We were getting Sierra throughout the week, and now we are getting mostly bonita. The yellowtail were biting early in the week. There were some big boils at times! The full moon is over and they should be biting again soon. 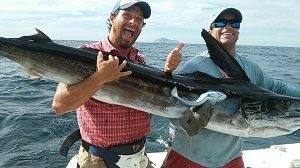 We caught marlin in 80 ft of water. We have had a handful of short hookups on the Rapalas. They are working the bait balls off La Manga and in the Bay. They should stick around for another week, so get out there before they are gone! We are getting a last taste of summer here. A hurricane is also actually looking to graze us, and we’ll be lucky to see some increase in southern currents. Cabo might get a good breeze though! A front dropped it down to a frigid air temp of 63 degrees last week. There were a ton of marlin in close for a few days. Then it seemed to thin out. The water temp dropped, causing the water to cloud up, but now it’s on. There is still some dirty water and it will be a full moon, but get out there tomorrow. I saw lots of marlin today within a mile of La Manga. There were yellowtail boils all over, but they were tough to get. I saw marlin, boiling, tailing, and one behind my bait… I had headed back to get bait, and upon returning, sure enough got one in the afternoon. What a rush! Solo-handed on a 15 ft skiff! I also managed to jig up 6 more 10 pound yellowtail in the afternoon. I’m not saying that everyone is catching, but they are out there! It’s not looking good for the pelagics. There is an entire week of wind forecasted. Monday was too rough to even go beyond the points. We stayed around Honeymoon Island and caught a lot of Skipjack, a big Sierra, and one nice pargo. The fish are coming to the surface. After months, I finally saw a ‘jumper’. We have seen a number of fish tailing too. A beautiful break showed up to the south last Tuesday. We made it out on Thursday before the wind really came up. It seemed to turn the fish on though. 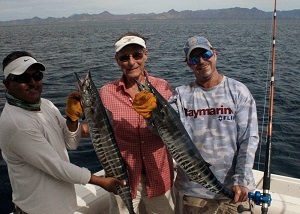 We released three marlin and two sails, along with two dorado. The bull went about 23 pounds and crashed a popper. I think we may have seen tuna too. The warm clear water pushed fish into within a mile. We have had a handful of marlin and sails released over the last few days, all within two miles. Other boats have had some success too. Inshore, we have been getting a few toros, lots of Skipjack, and a number of 3 – 6 pound Sierra. They are superb fresh off the smoker. 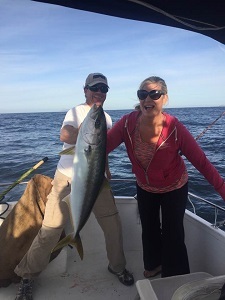 We caught one small yellowtail, and one was caught jigging. Maybe after this next blow the bonita will come in. The shorelines still have a number of predators around attacking the massive amount of bait. A warm plume of clear water came up early in the week with a number of billfish. There were some big sails and a number of marlin on the end of the Reef on Wednesday. On Friday, we hooked a 300 pound Blue that put on a spectacular show. It wrapped itself and burned through the second angler. I was handed the rod and the fish went near to the bottom in 1200 feet of water. I figured it had died and maxed out the drag. I inched it up for 20 minutes with the help of the waves. It was the only billfish of over a hundred this year that died on us. It was unfortunate but it fed a lot of individuals. The last couple of days have been very tough. The water is still pushing 80 degrees, but it is fairly green. I think the billfish are around but still on bait balls down deep. 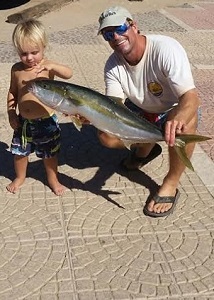 There are a few small dorado around, with a few better ones caught off floating objects. They could be out there around big sardine balls. The fishing is slowly picking up. Light northwest winds are keeping it cool, but also keeping the water greener. The water temp is finally in the low 80’s, and there is some clear water out there. There is some good bait offshore in areas. Look for the breaks. The fish are not on the surface yet or jumping. On Tuesday, we found the fish on the end of the Reef. 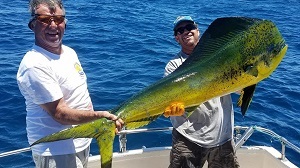 There are a few dorado out there, some pushing 10 pounds. We are seeing more marlin and some big sails. We released one 200 pound Blue this week. The billfish bite is decent, but they prefer bait. No floaters have held fish, besides one dead sea lion we raided on Monday. I heard of one possible report of a few tuna caught on the other side. There were some good Sierra off San Antonio after the last front, and we picked up one 6 pound Cabrilla in close. The big Jack Crevalle are here and there around the Bay. There are big schools of bait around in close, with predators not far behind. 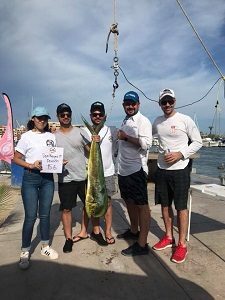 Congratulations to Team Predator and Fantasma from San Carlos, who placed in the Release Divisions at the Bisbee’s Black & Blue Tournament in Cabo San Lucas. Predator was third with one early release, and Fantasma second, being the second boat to release two blue marlin. Their checks weren’t quite as big as Tranquillo’s $2.35 million! Things are slowly picking up for the fishing. We are catching a billfish or two a day, and not too far out. The bite for sierra and skipjack is decent. 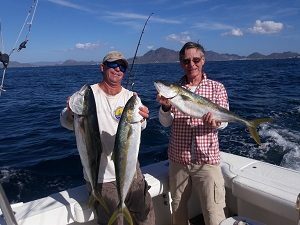 A few small dorado were caught not too far out. 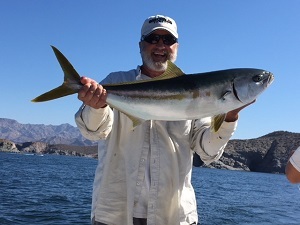 We just got back from a three day trip across, passing Tortuga Island to Santa Rosalia, San Marcos Island on the way to Mulege, and home to San Carlos … and only finding one 4.5 pound dorado along the way. I don’t know why. We passed a ton of flying fish. Hopefully there are still some to the north. We did find a number of sailfish, a few marlin, a couple yellowtail, jacks, triggers, and cabrilla. Santa Rosalia had a major rain on Saturday, but they were cleaning up early on Monday. 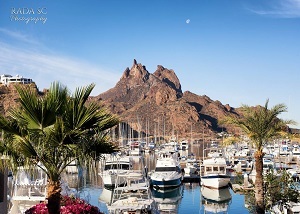 It is an interesting little town, but the group favorite was Mulege. It was my first time there, but we are already making plans to return. We found some great snorkeling and enjoyed a lot of great scenery. The water is still in the upper 80’s and blue. I don’t know what to expect, but I think we’ll continue to see steady improvement. Well, we’re back to catching fish. The weather has been teetering on cool to hot throughout the days, with some showers too. I saw my first waterspout on Tuesday — it lasted 90 minutes. The billfish have been a little tough a times, but we are getting some releases, with a couple boats getting four on Saturday. I have not heard of a single dorado caught or seen, but no one has been heading out very far. We are getting some nice Sierra all around, with a lot of Skipjack. There are a number of snapper in close. Look for the pelicans looking to pick up the scraps. We finished the day today with a nice 25 pound jack. There were huge schools chasing bait in a few feet of water around Honeymoon Island. Reports were of lots of flying fish moving in, so hopefully the dorado will show again soon! Labor Day weekend saw 13 boats compete in good weather conditions. The fishing was not so good. Over two days, only eight billfish were released. Grey Goose released two the first day for the win and the invitation to the World Offshore Championships. Second place went to Predator with a sail release and one 12.2 pound tuna. No Limit weighed the only weighable dorado at 12.2 pounds. The water wasn’t very clear, which may have led to a number of fish lost. Besides not many fisherman out there, a major algae bloom greened up most of the entire sea for a few days. It was still very green this last week leading to poor hunting visibility for the fish. That, coupled with water around 90 degrees, leads to some tough fishing. The dorado still haven’t shown up, though it sounds like some are being caught by the long lines on the other side. Even the small ones in close seem to be very scarce and even smaller. 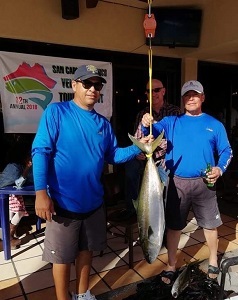 The recent Dorado Derby was won by an 11.65 pound dorado, and a tournament off the East Cape was won by a 13 pound dorado. It is not looking like a good year for dorado. We did find… off California. 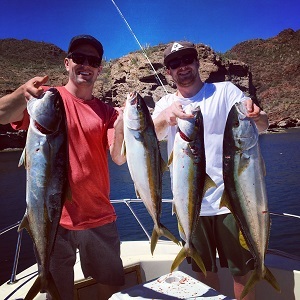 We missed the epic bite by a week, but still caught about 100 dorado and tuna to 15 pounds. In Utah, I caught about a hundred 4 – 7 pound rainbows at a friend’s lake. Point Reyes, California gave up a few halibut to 24 pounds, along with ling cod, rockfish, and one King. The Rogue River one 12 pounds King, some small bass from the Sacramento River Delta and Crow’s Nest, N.C., and one 10 pound Redfish from North Carolina. Now off to the mountains of Colorado! We are catching limits of dorado in San Carlos, but unfortunately they are all smaller ones weighing between 3 – 7 pounds. The small ones are within a mile, right up to the harbor entrance, and up and down the coast. They will be a decent size in the Fall. Small lures work best. We did have a nice 150 pound marlin come in on a 3″ lure inside the Bay. I scrambled for a ballyhoo and pitched it to him but the hook didn’t set. There’s lots of small skipjack too with a few Sierra around. There are very few sailfish being reported, but they are out there. One big dorado was caught by a boat coming back from the other side. Most boats are content sticking in close and just getting a few fish for dinner. The bait is out there, but we’ll need some big storms to change up the action. It’s hot out! There are some pleasant days on the water though. We found lots of small dorado within the first mile on Monday. Sailfish were seen and one was caught a mile out too. We were out on Sunday to 42 miles seeing hundreds of Risso Dolphin and near a thousand Bottlenose Dolphin. We had a dozen sailfish bites and half were hooked up, but we only brought two to the boat. Some friends went farther — all the way to Tortuga, but also only caught two sailfish. 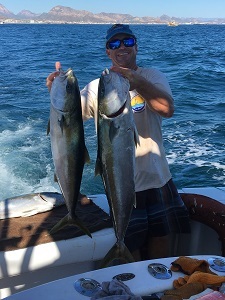 Other friends found some good dorado and yellowtail within a few miles of the other side. We have found sailfish scattered in close and around the Reef with a few dorado weighing up to 12 pounds. There were also a few whale sightings out there. I am not sure when things will change too much, but it seems to be improving somewhat. Thirteen boats and 38 anglers came out for the 68th International Billfish Tournament. The seas were calm and the breezes kept us cool. 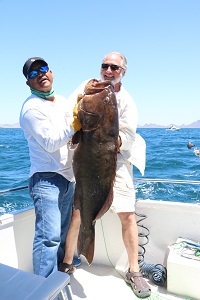 We caught the only weighable dorado at 21.4 pounds. A friend did catch one over 30 pounds yesterday. Some good ones were caught and lost over the week. I did hear of one 70 pound wahoo landed. 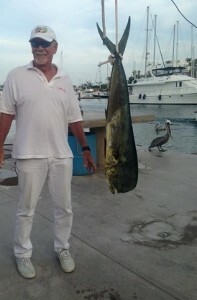 Our dorado was beat by Santa Maria’s 72 pound sailfish for the Saturday jackpot. Cortezano would have won all the jackpots if they had entered. They hooked up a double on Black Marlin early in the day, losing the first after several hours. The second stayed on for 6.5 hours, until they could plane the dead fish up. It broke the rope and maxed out the scale. Measurements put the fish between 550-600 pounds. That’s the largest ever weighed in a tournament here! That fish along with four releases on Sunday won them top boat! We were one fish behind them all day, for second, but 1st place overall jackpot. Reel Mistress came in second with their top angler Dave Williams sharing the top angler honors with myself. 33 sails and 6 marlin were released. There are pretty slim pickings on fish in close. The best action was beyond the Reef. We released 7 in two days, shaking off and missing an equal number, so there was decent action. Some friends jigged up a yellowtail and some big grouper off the Reef. We are eating fresh fish. The 68th International Billfish Tournament is this weekend. Hopefully someone will find the fish! Good reports are few and far between. It even sounds slow on the other side. One couple did get lucky over there, finding a floating seaweed patch. They caught all they could handle, along with a few big ones. They also found some billfish. Another friend got into a huge school of sporting roosterfish. That’s a long ways to go though. Over here we’ve been plucking a few small ones off the buoys and in close. A few skipjack and Sierra are around. Very few billfish are being caught. I think I have gone an entire month without catching one! There may be some inshore species showing around the small anchovy schools. Well, we’ll see if anything changes anytime soon!